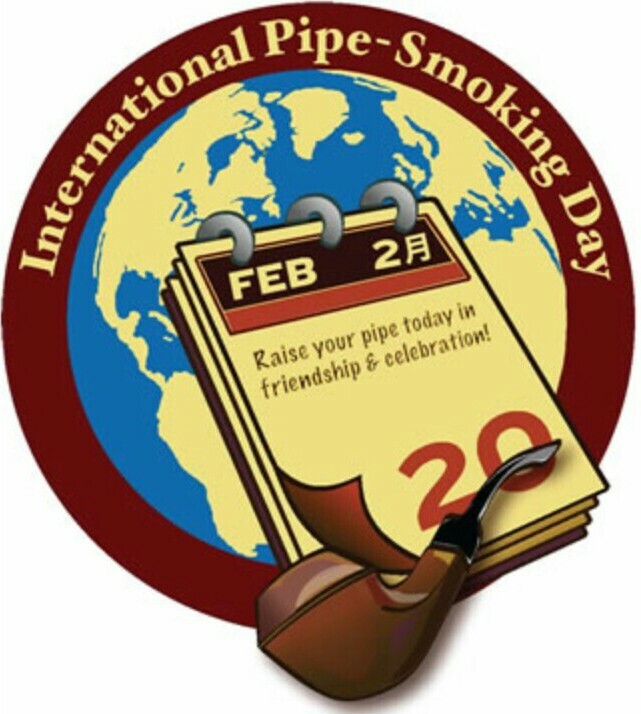 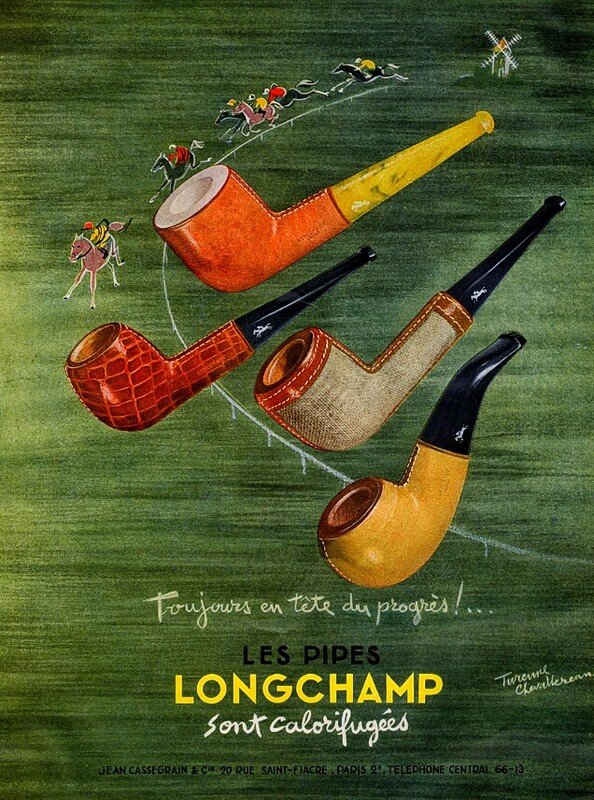 Happy International Pipe Smoking Day to all my friends, readers and fellow bloggers. 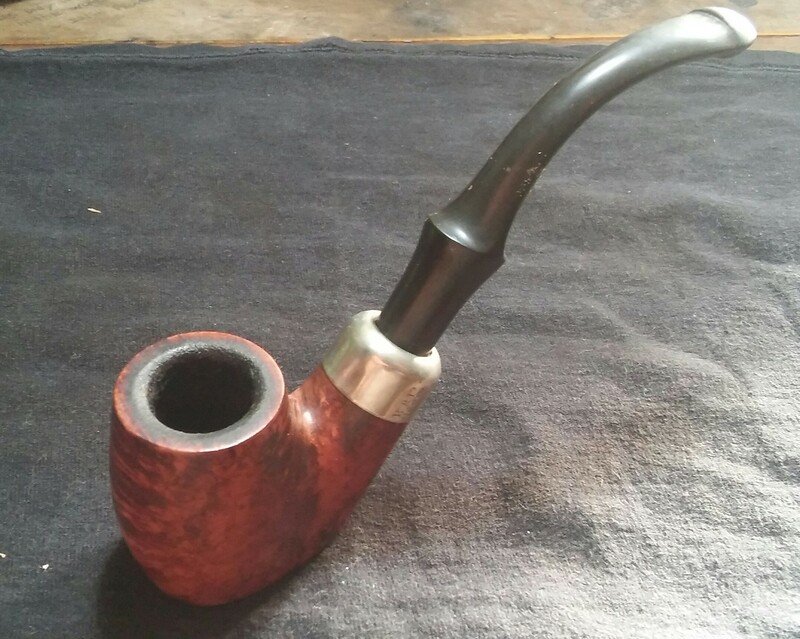 For the day I wanted something new, well new to me . 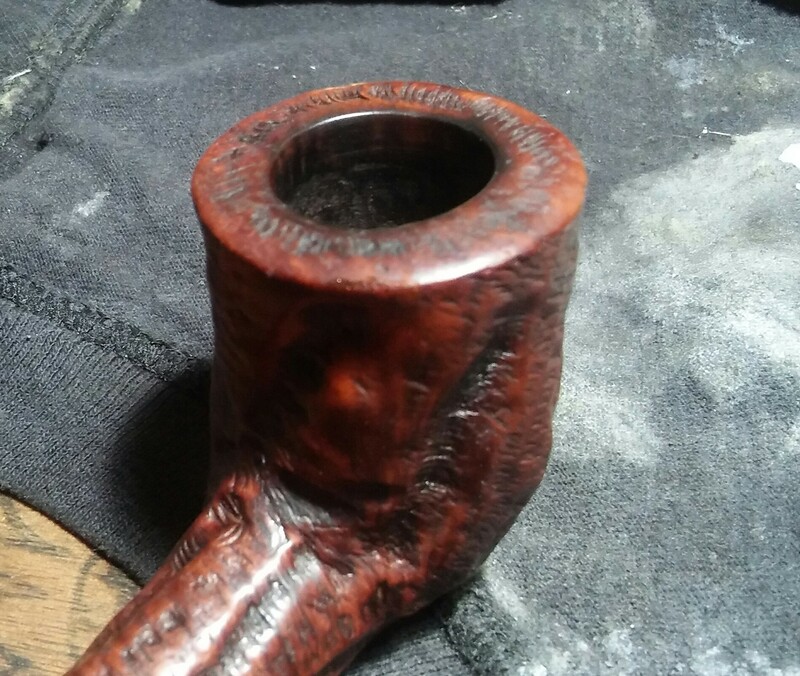 She came in on Friday just in time for a Saturday puff. 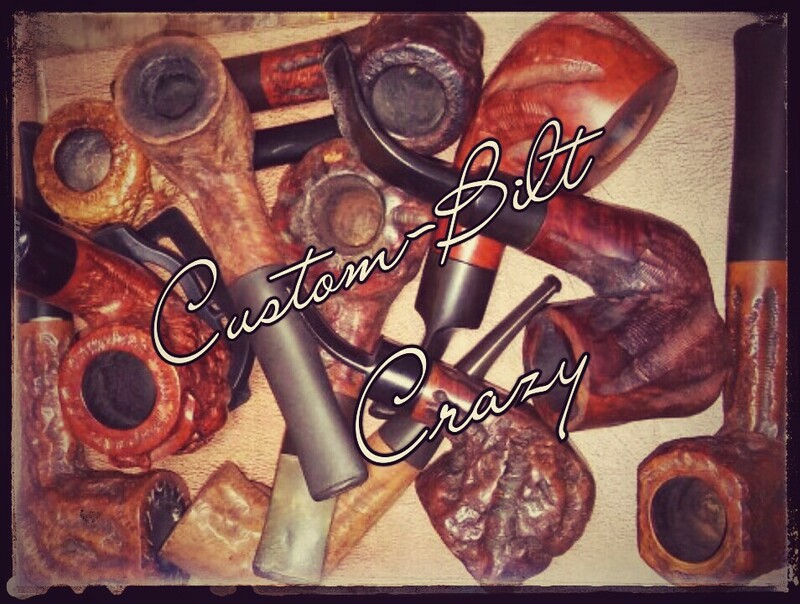 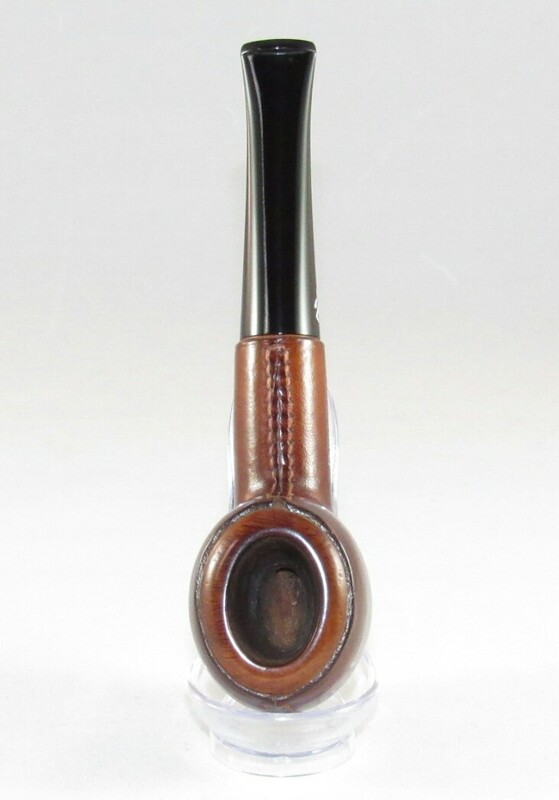 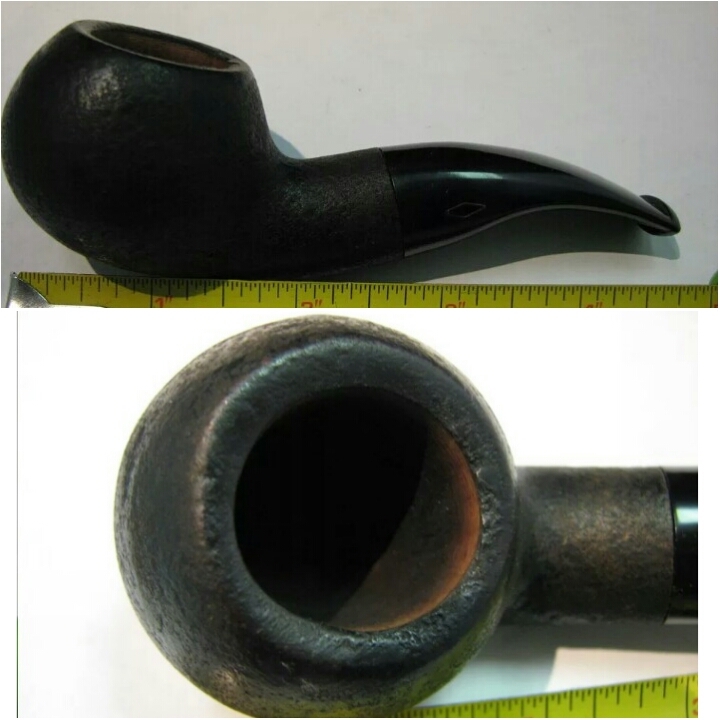 The Brebbia Fat Bob is a pipe I’ve been in search of in my price range for two year’s. 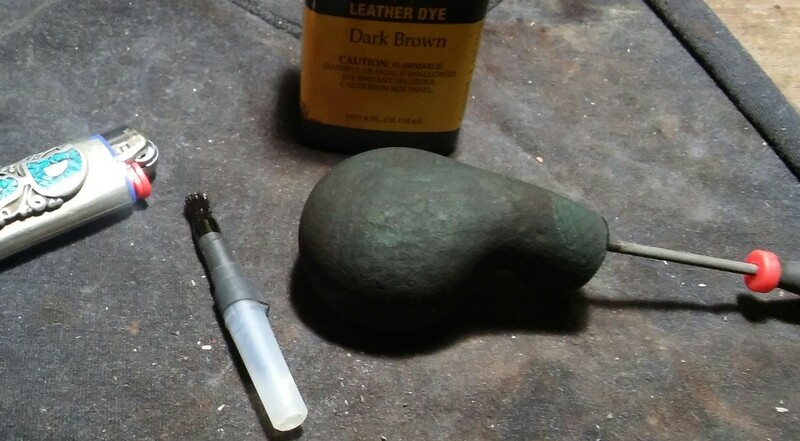 Now I’m unsure if that’s what I have here but if it’s not it’s a close match. 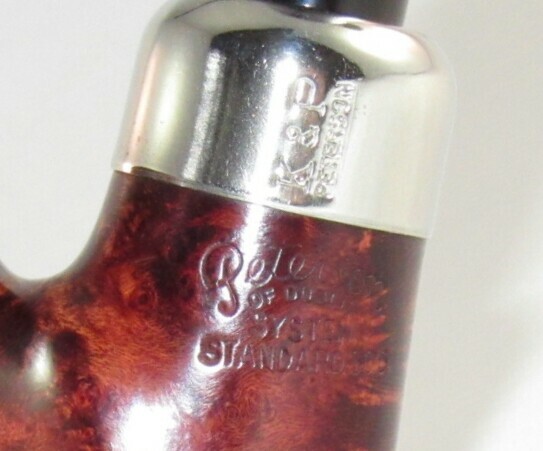 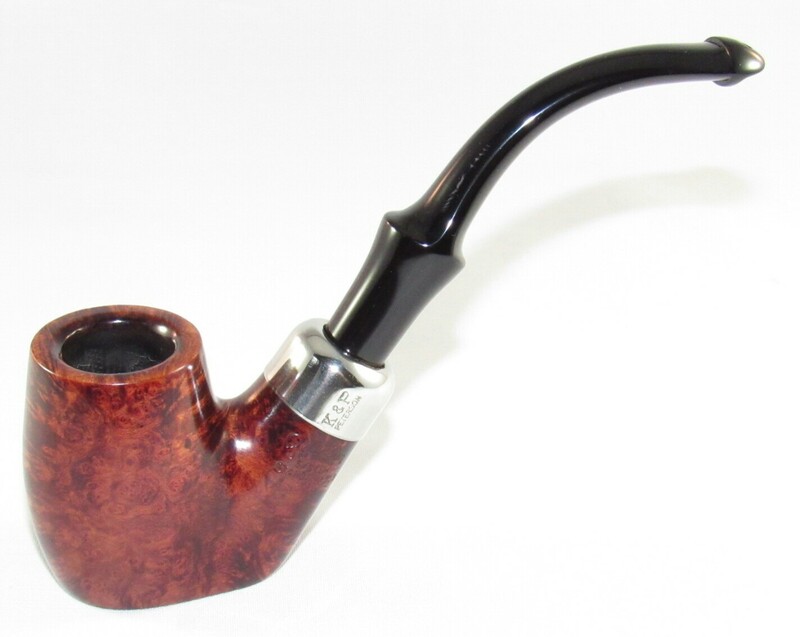 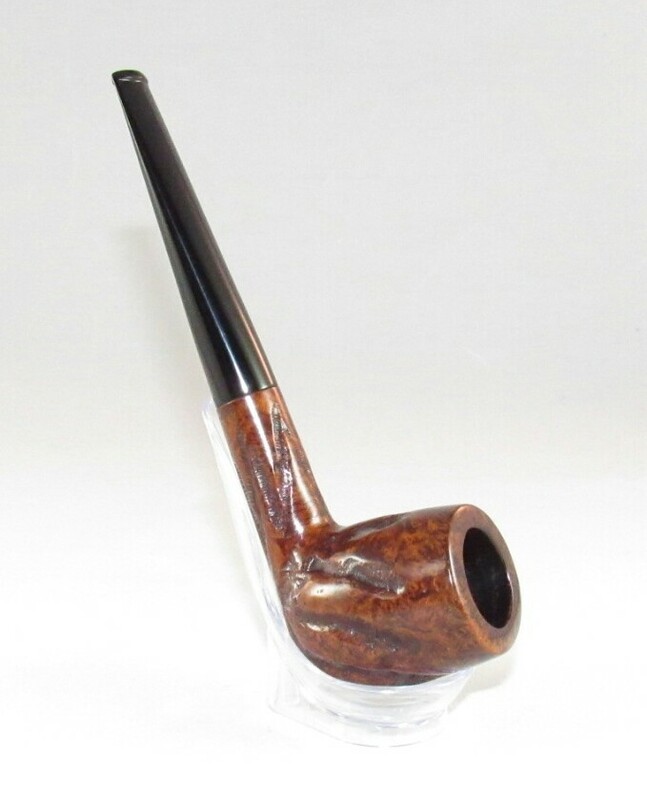 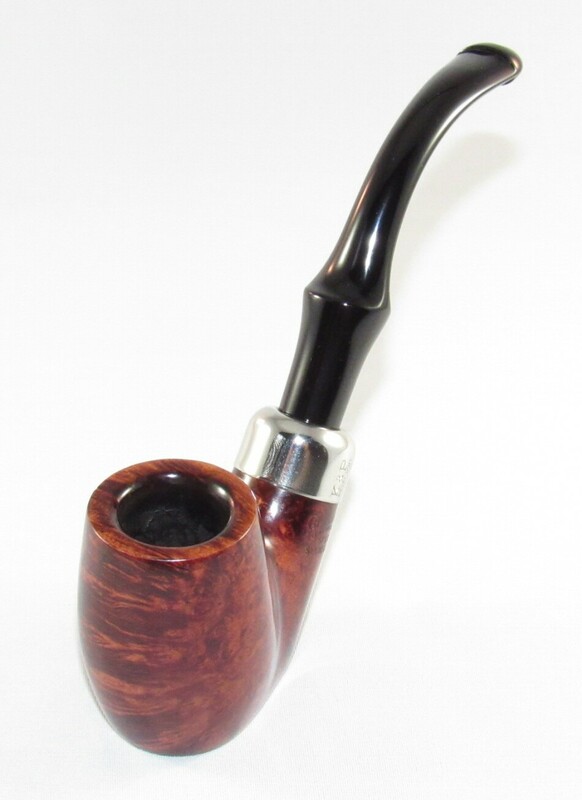 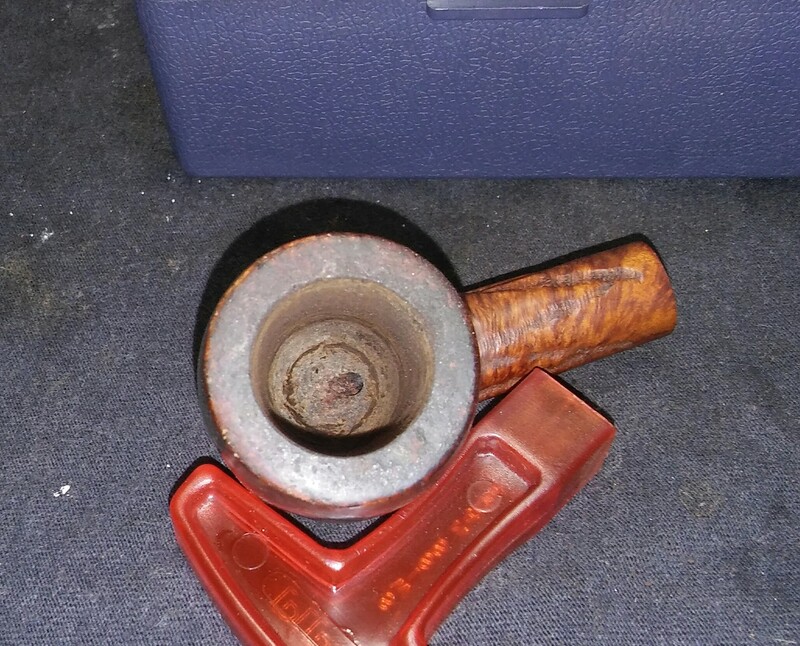 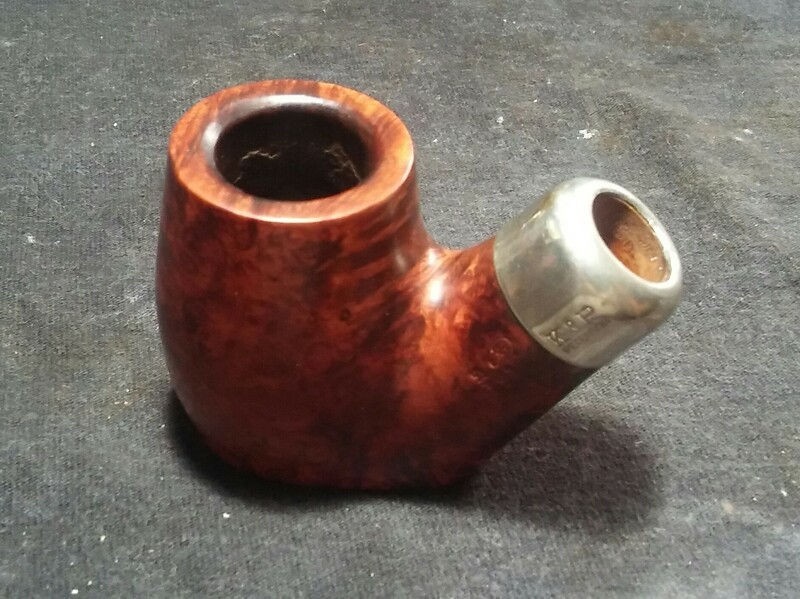 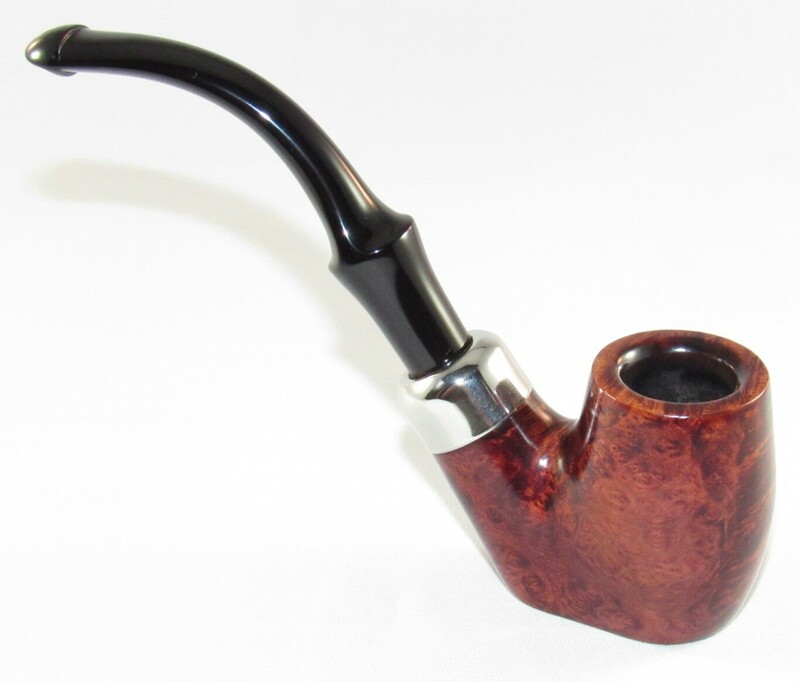 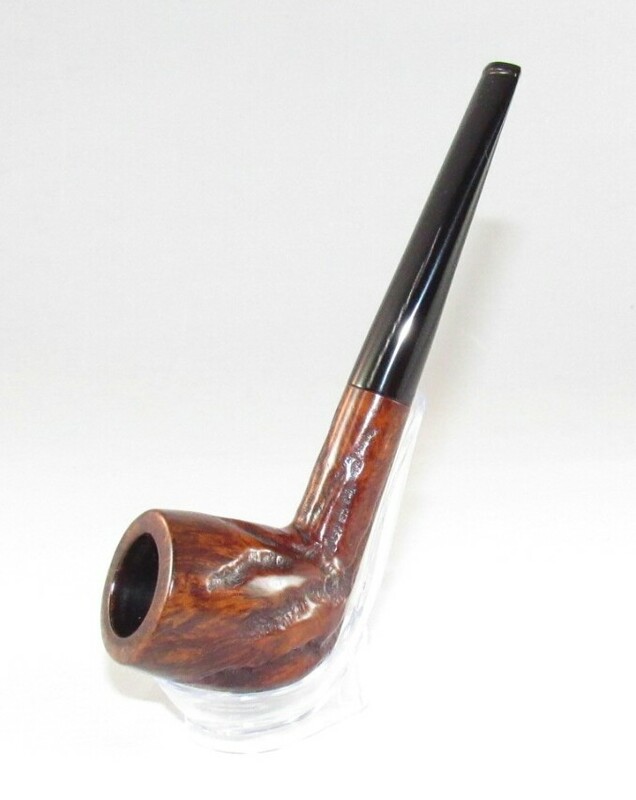 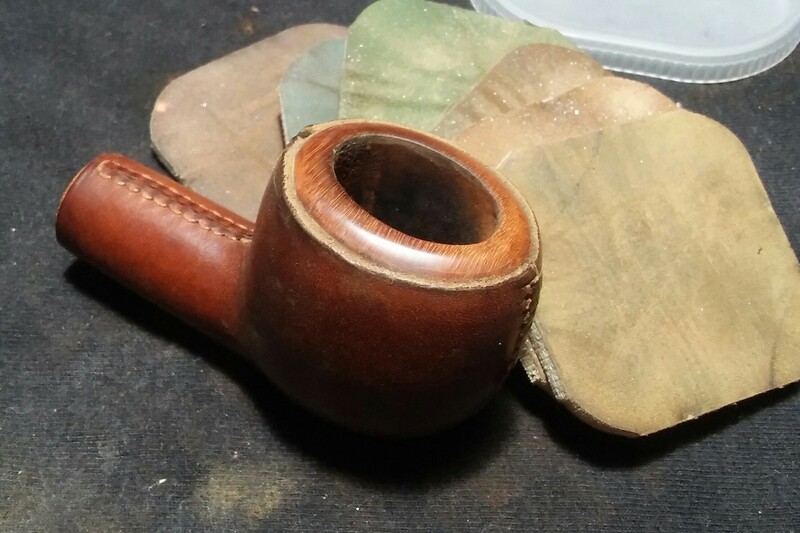 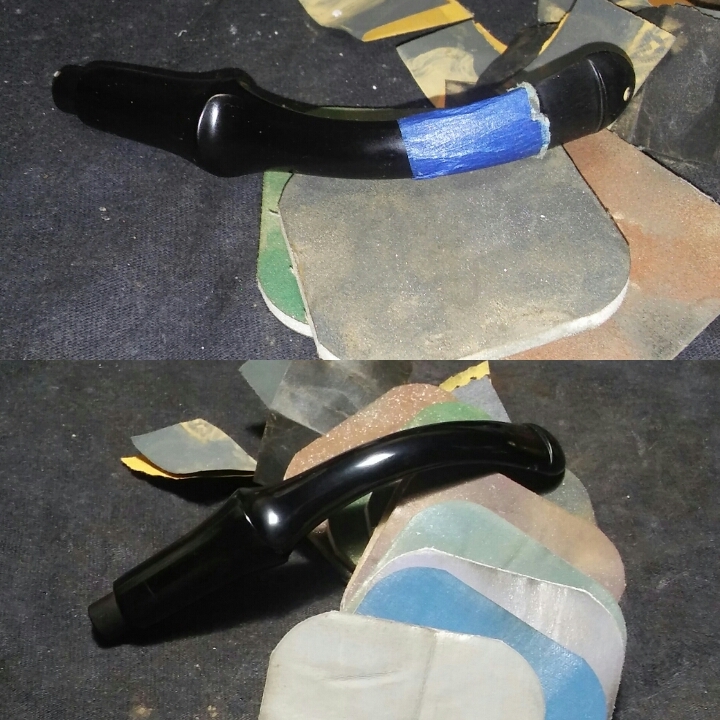 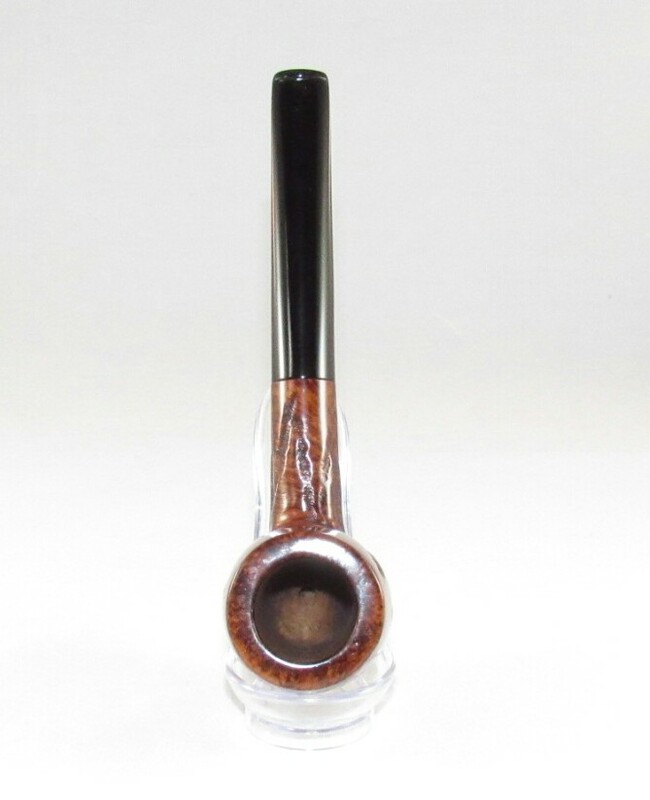 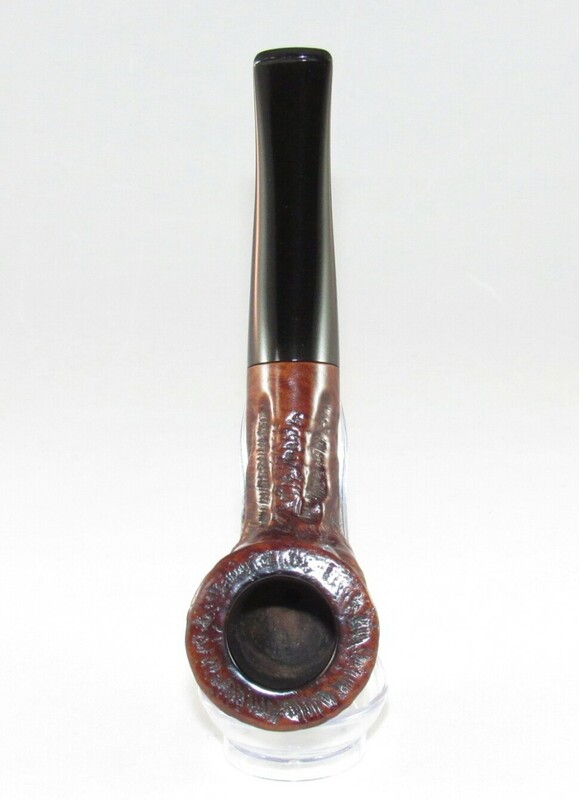 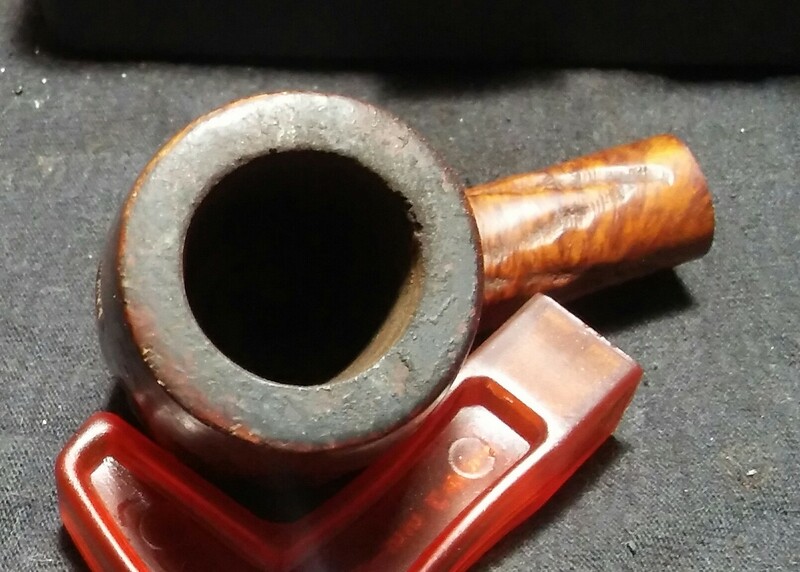 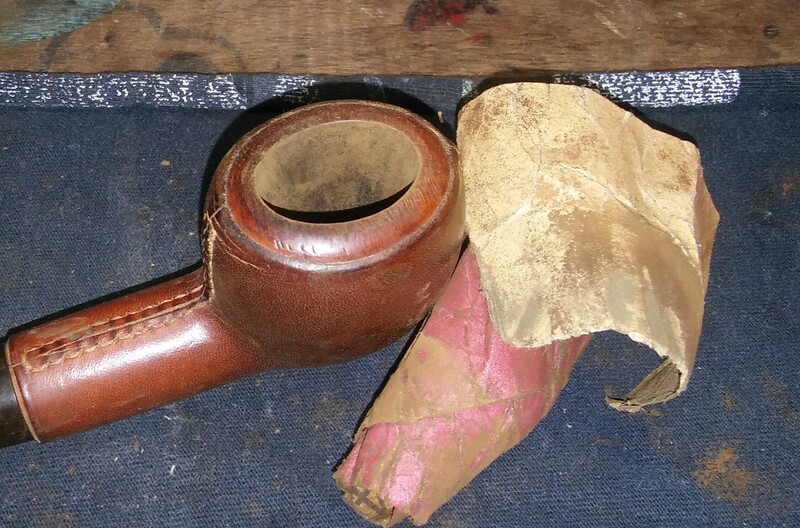 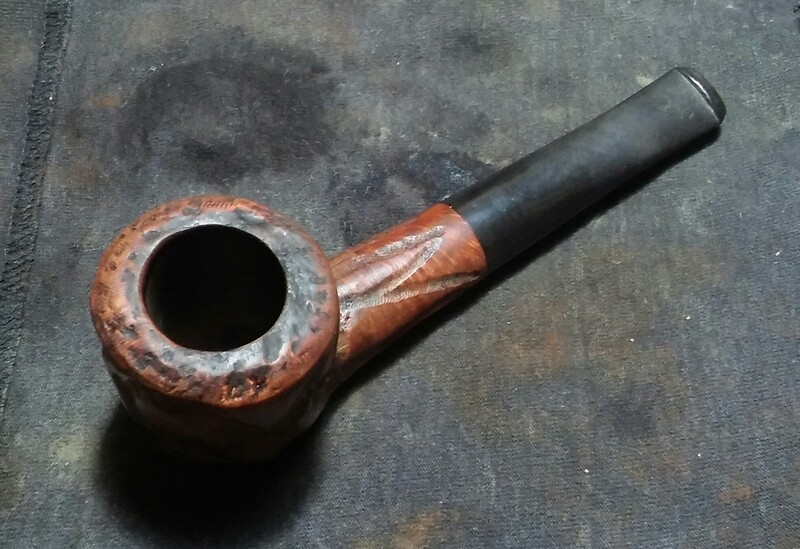 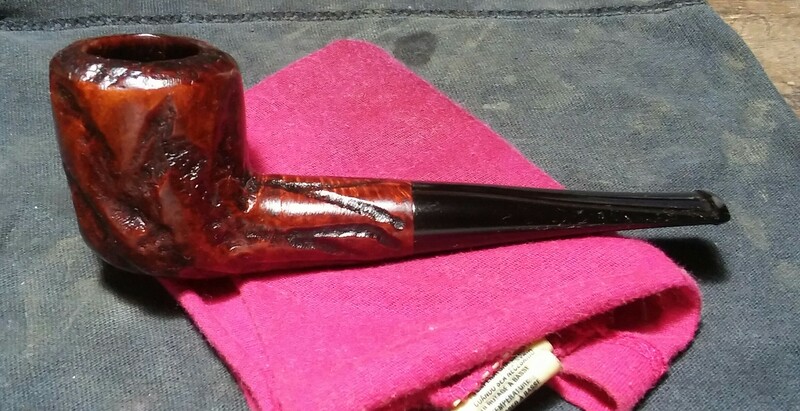 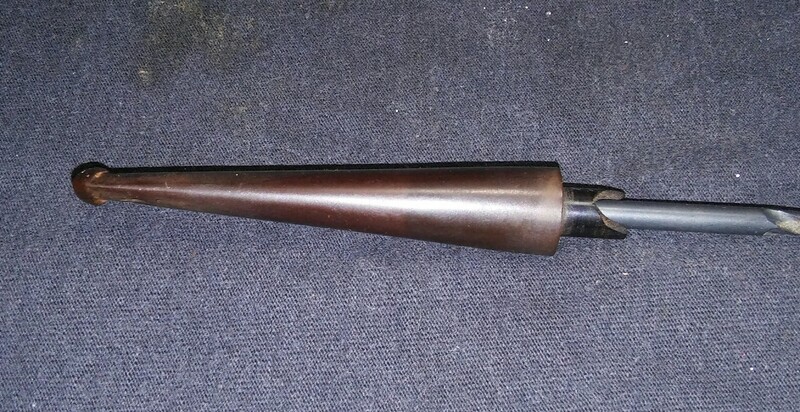 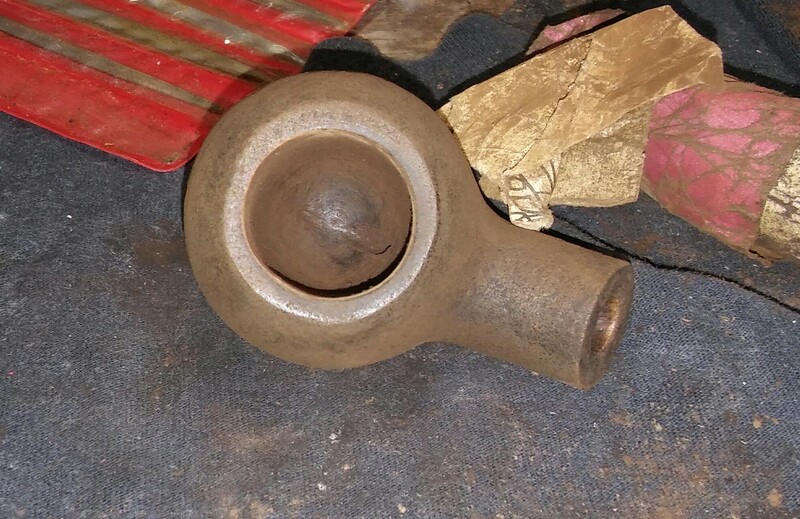 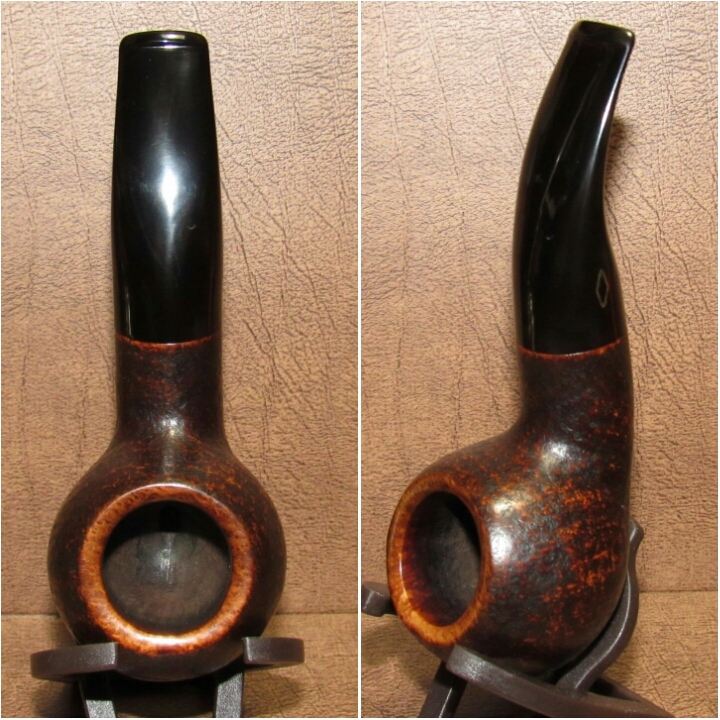 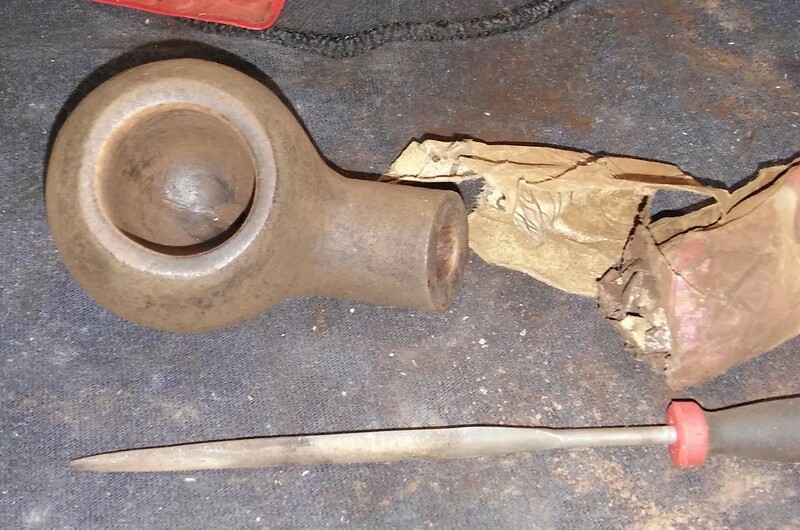 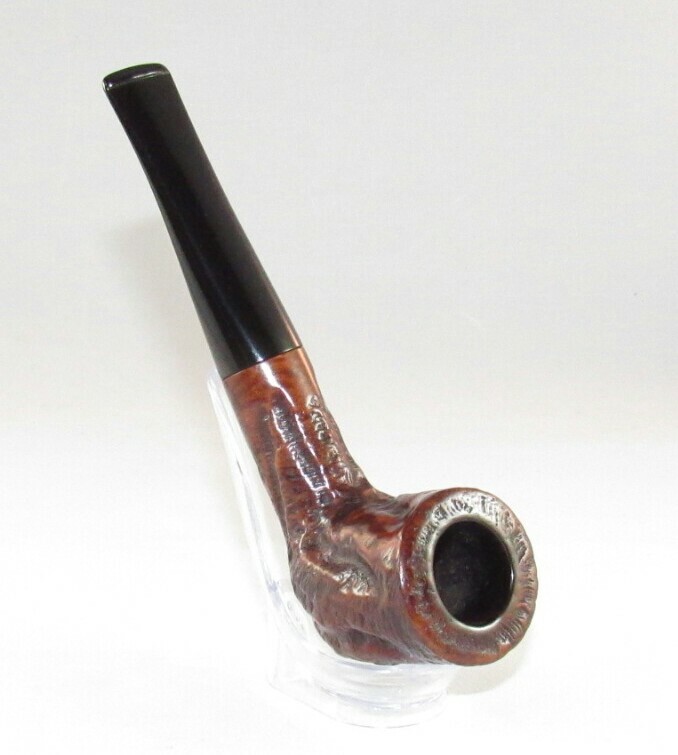 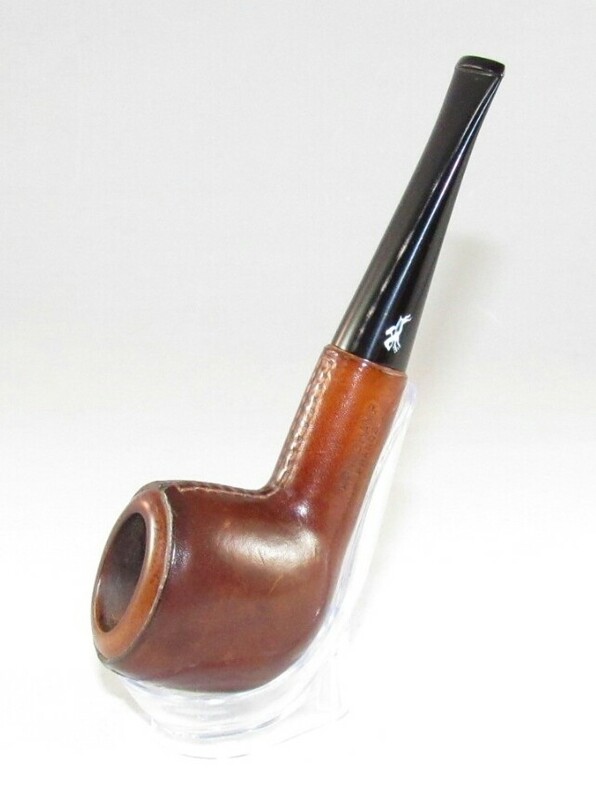 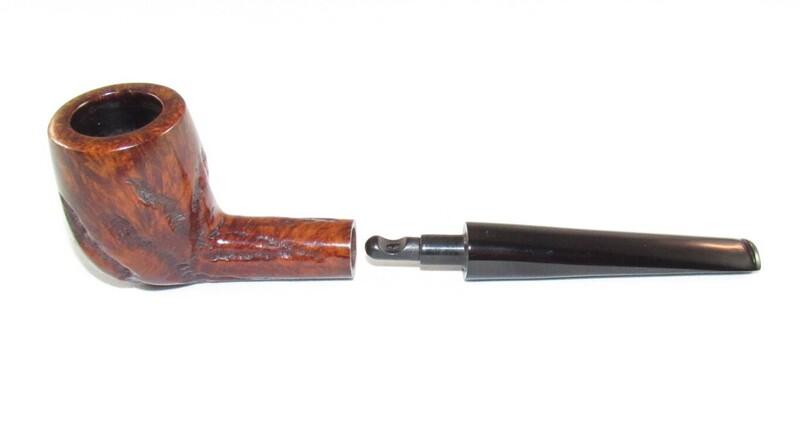 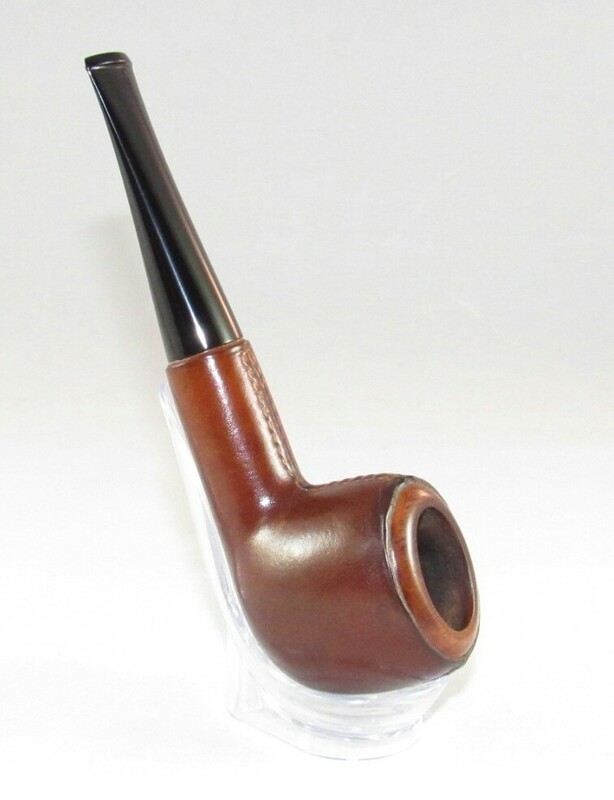 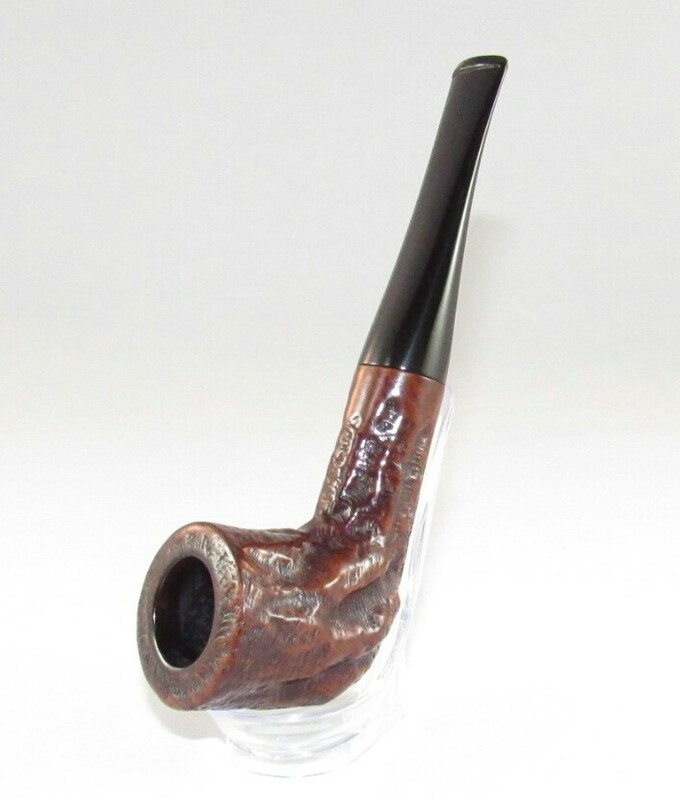 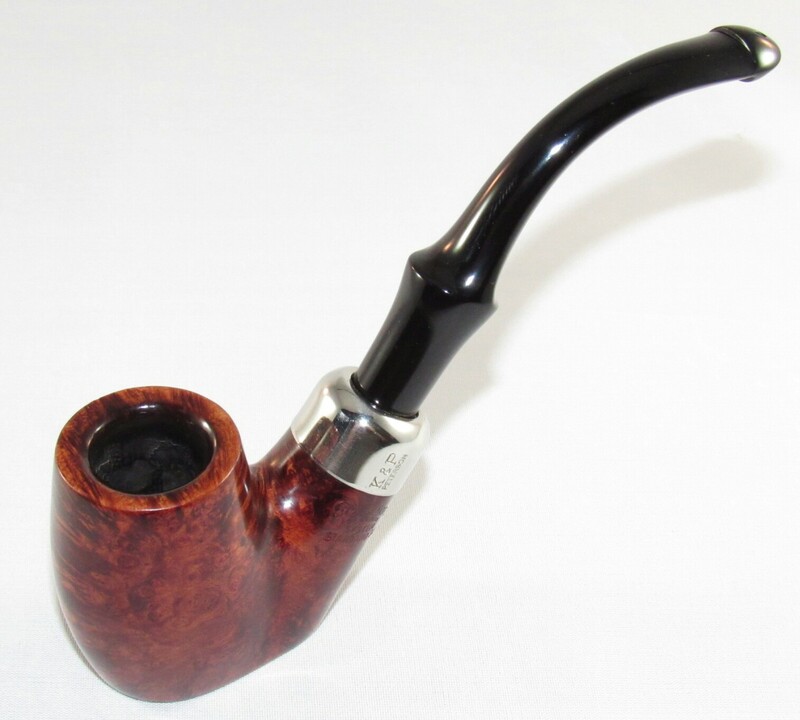 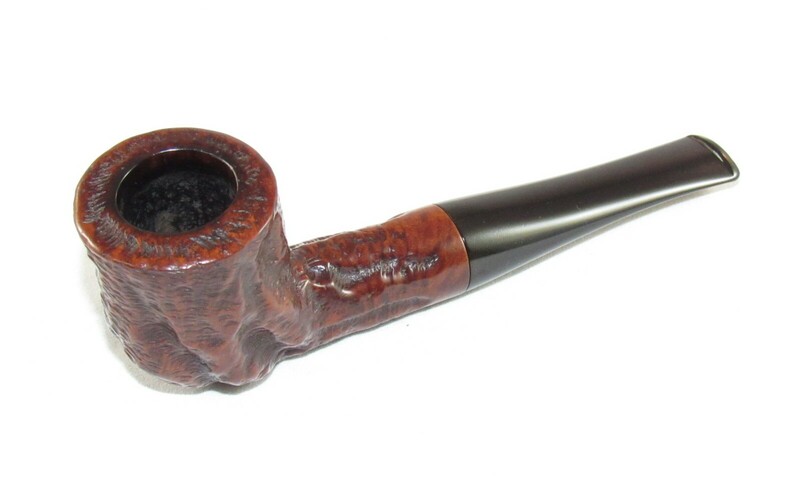 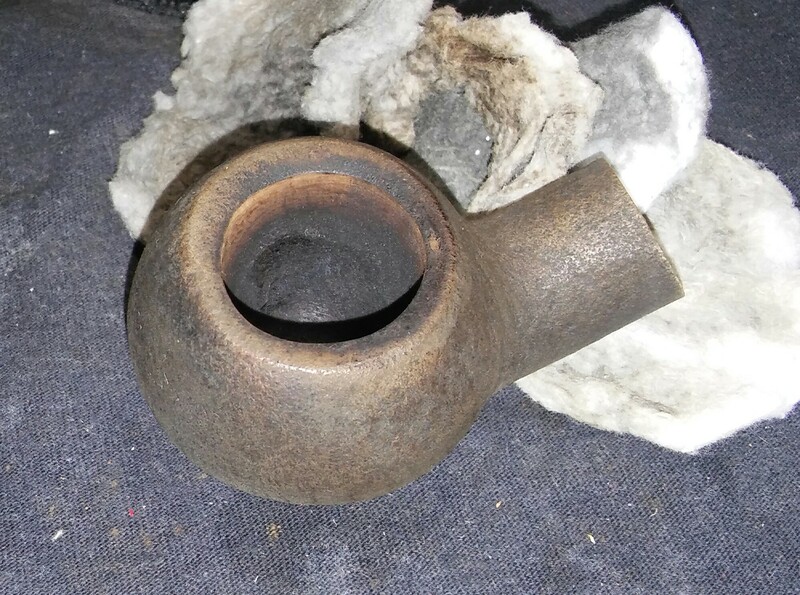 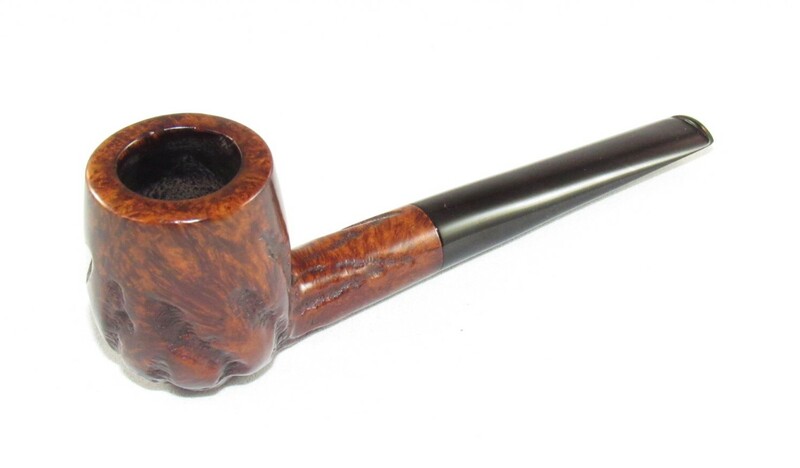 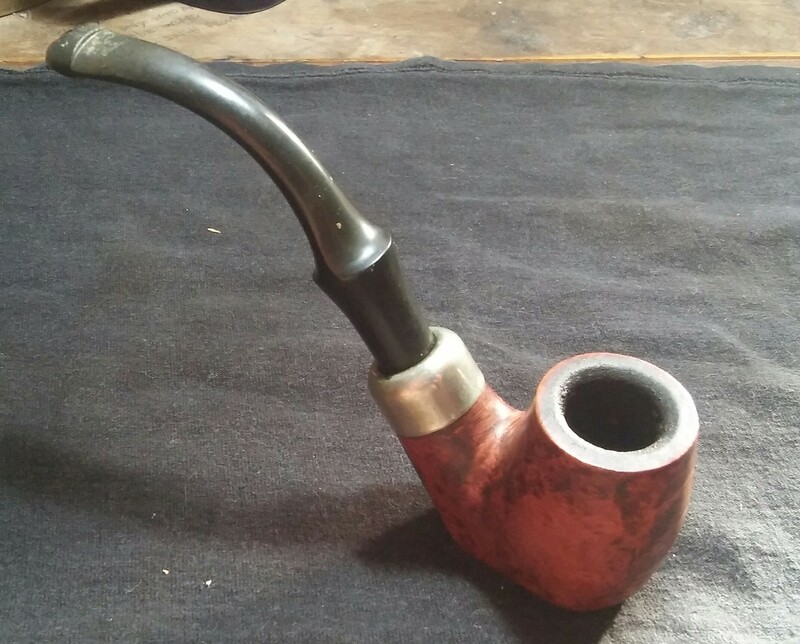 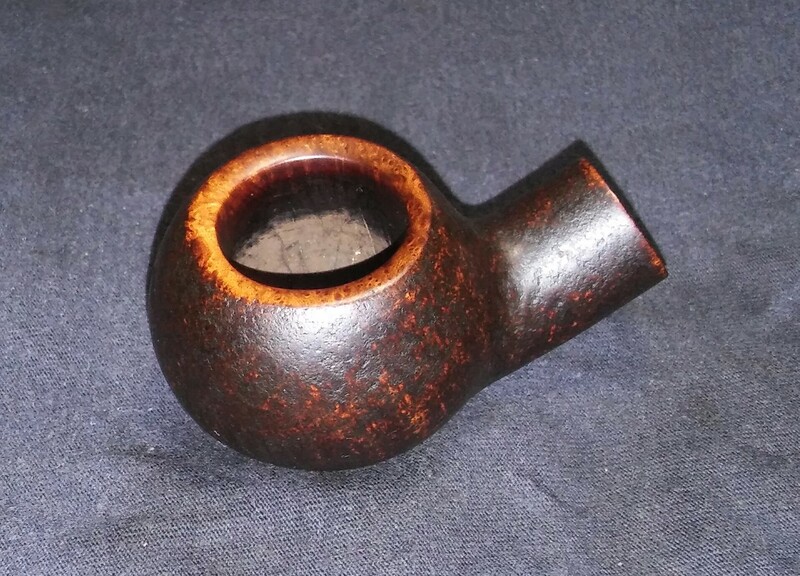 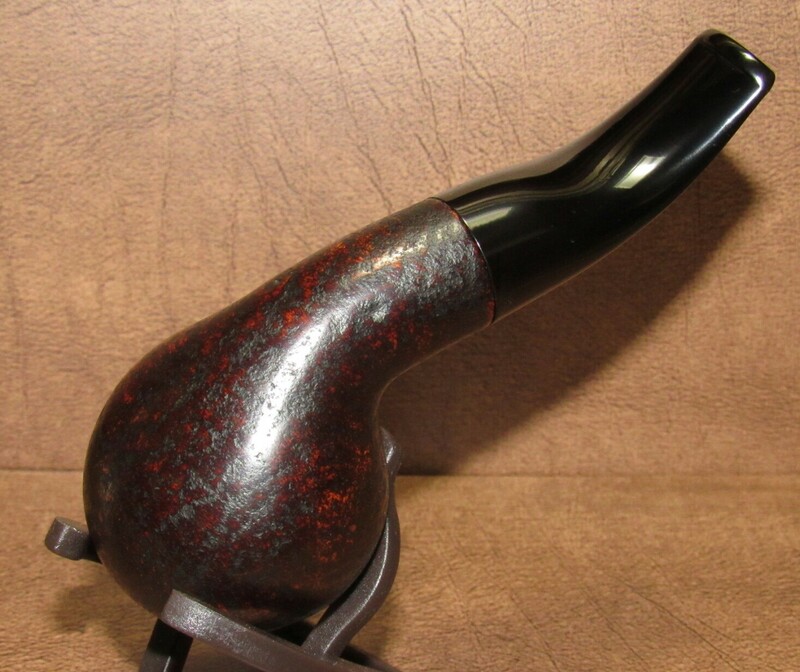 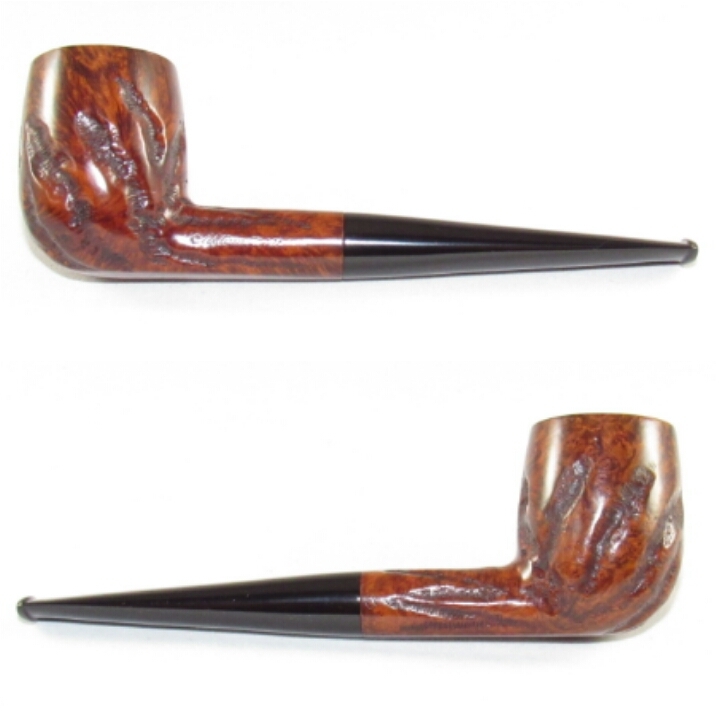 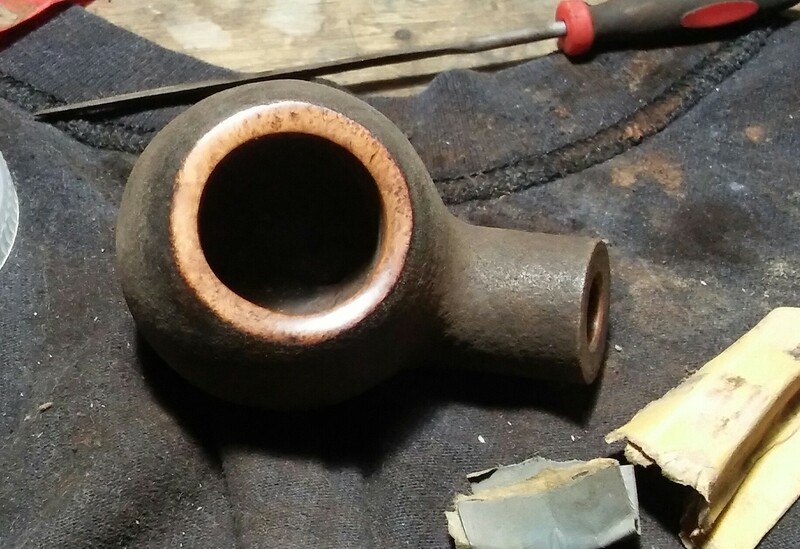 The pipe itself is unmarked but the stem has the Brebbia inlay. 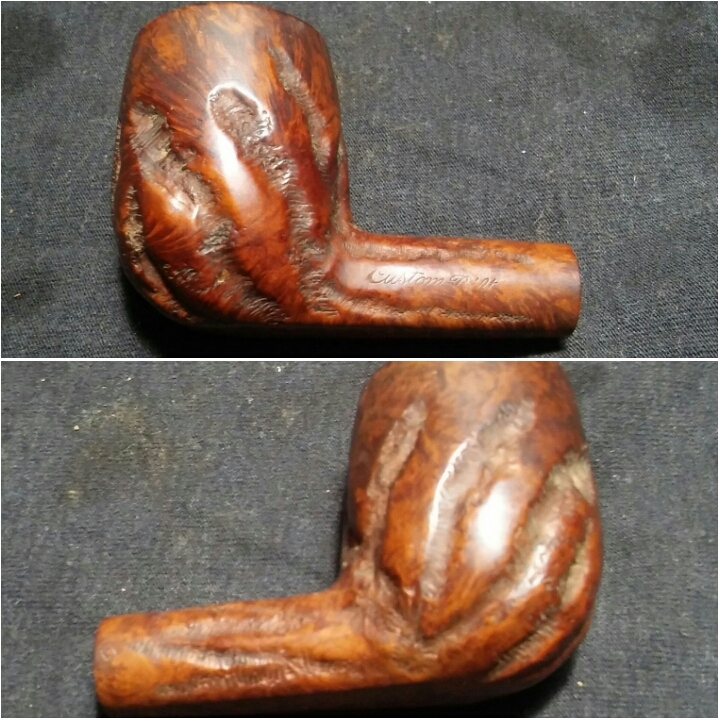 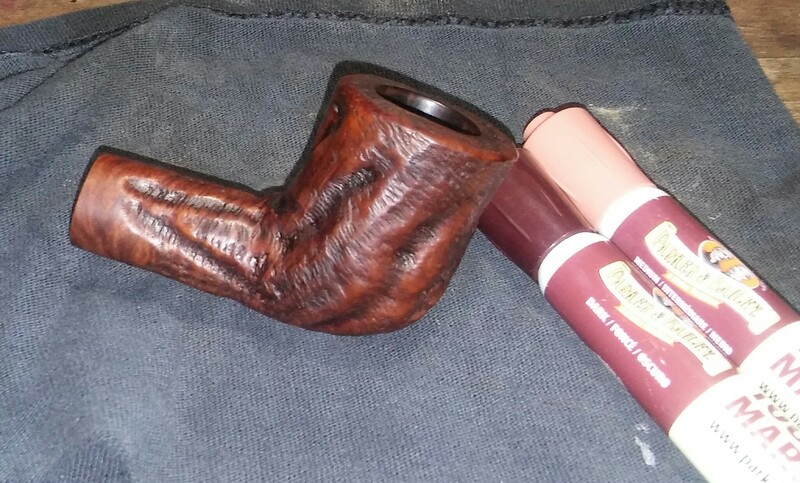 I have seen other unmarked Brebbia’s in the past made for private B&M’s. 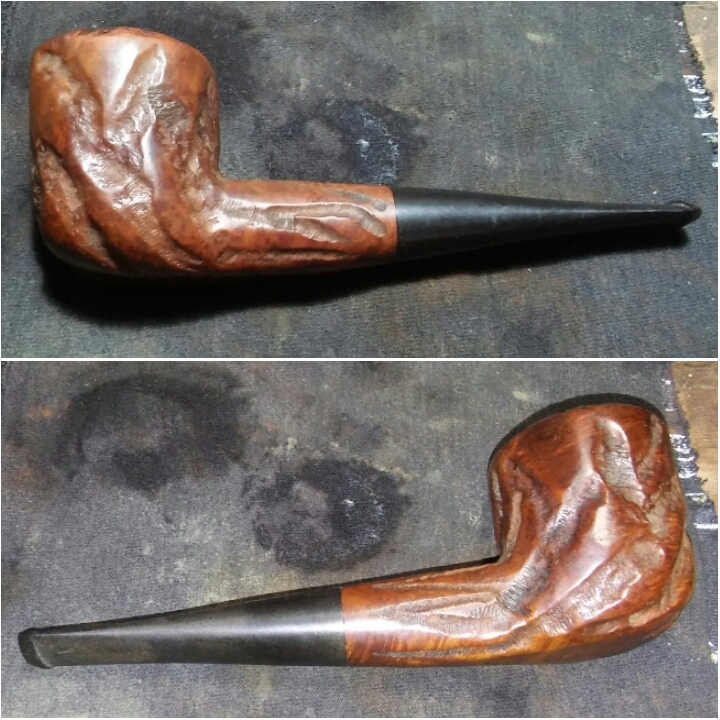 I got a little ahead of myself with this refurb and began working without stopping to take before and after photos, the photo above is from the auction. 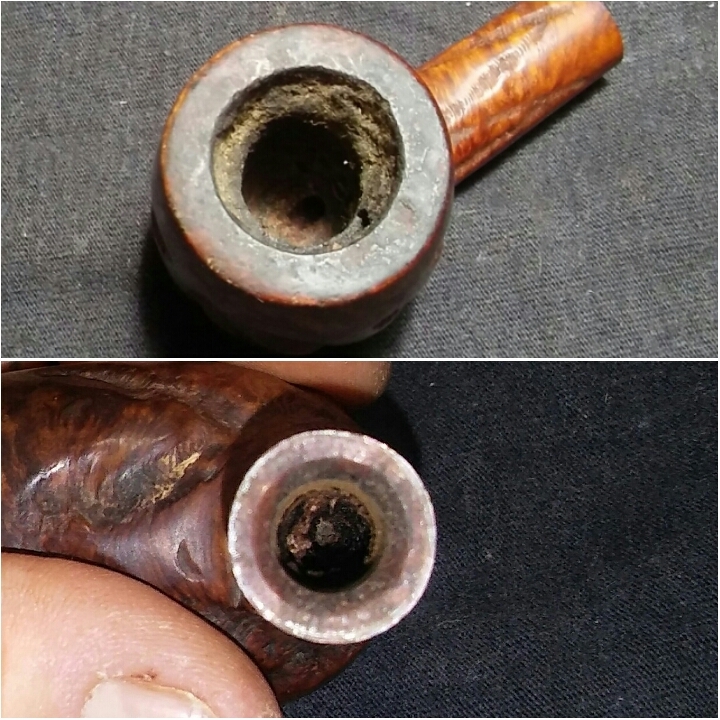 It was listed as clean and ready to smoke apparently my standard’s are a little higher than others. 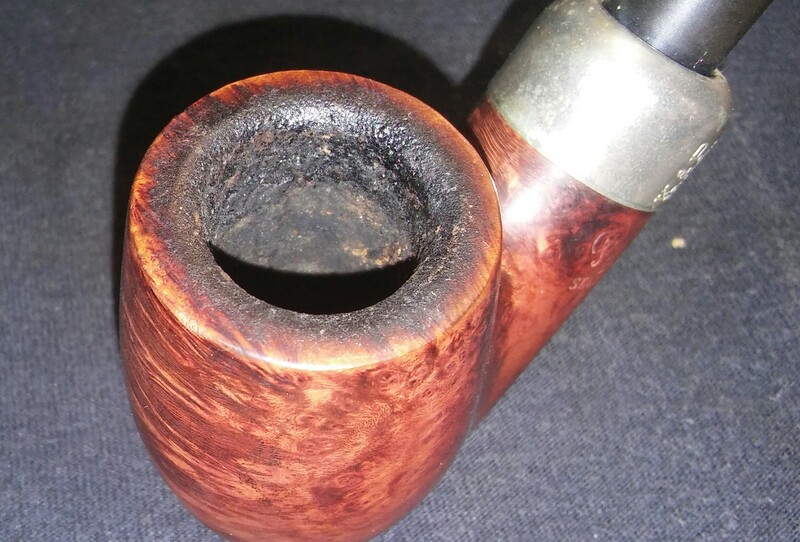 The pipe was badly reamed ( out of round ) and the chamber had the start of a burn out. 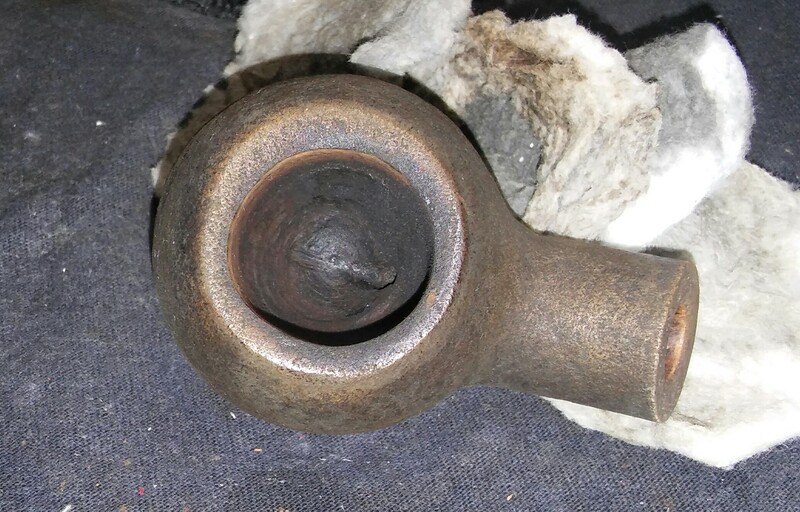 The chamber and mortise were still holding tars and oils, the black finish was worn in spots. 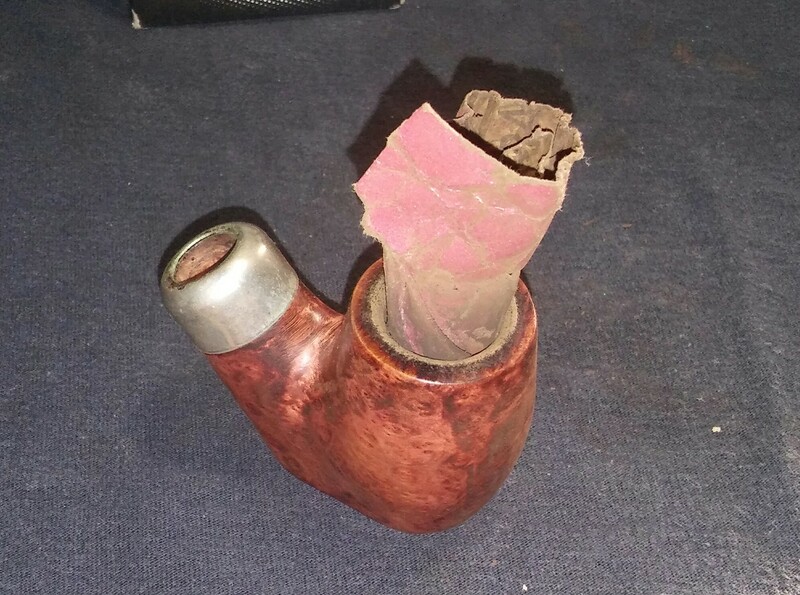 The stem on the other hand was spotless. 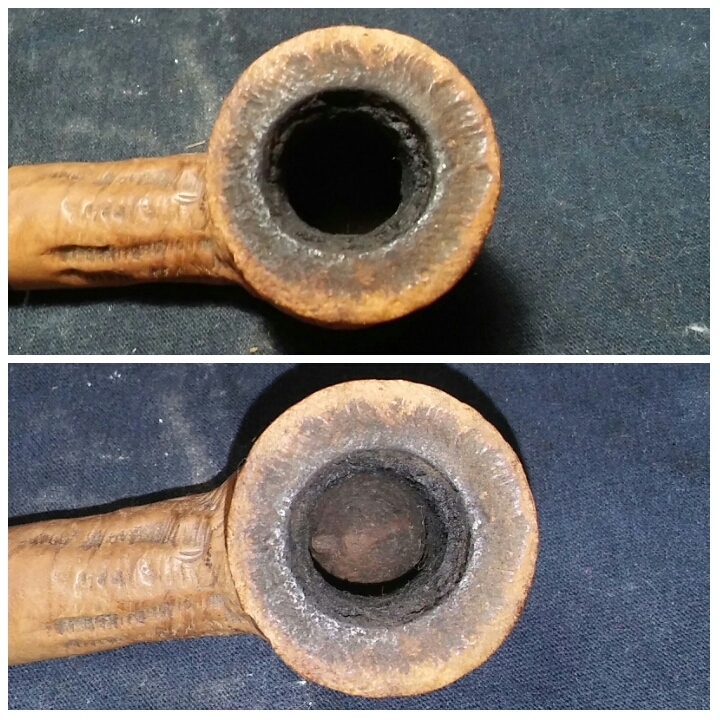 The above two photos are of the rim and chamber burn. 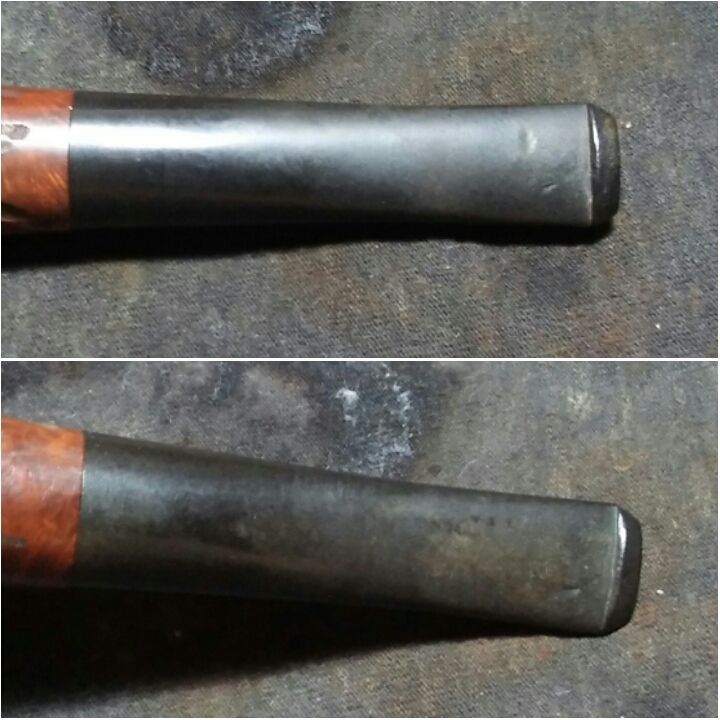 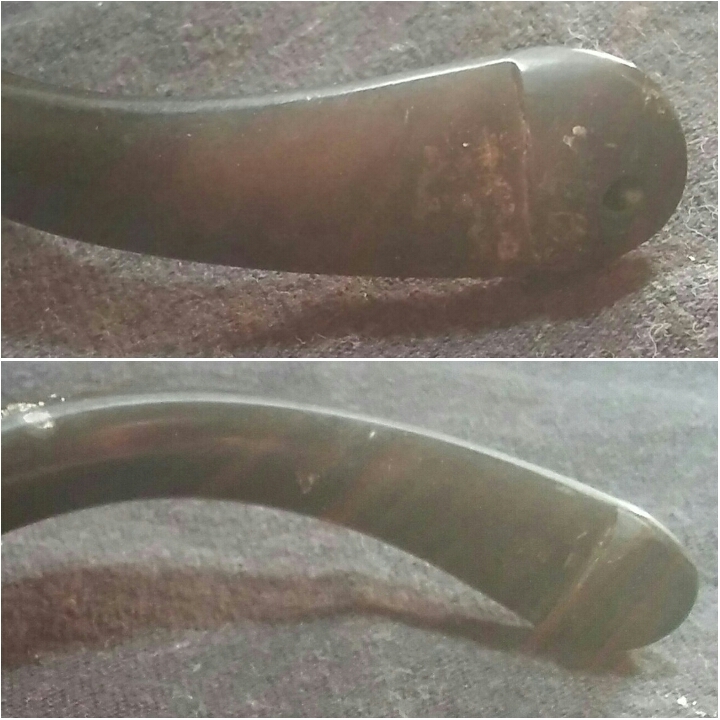 The right side of the rim was thicker then the left side and the chamber was reamed into an oblong shape. 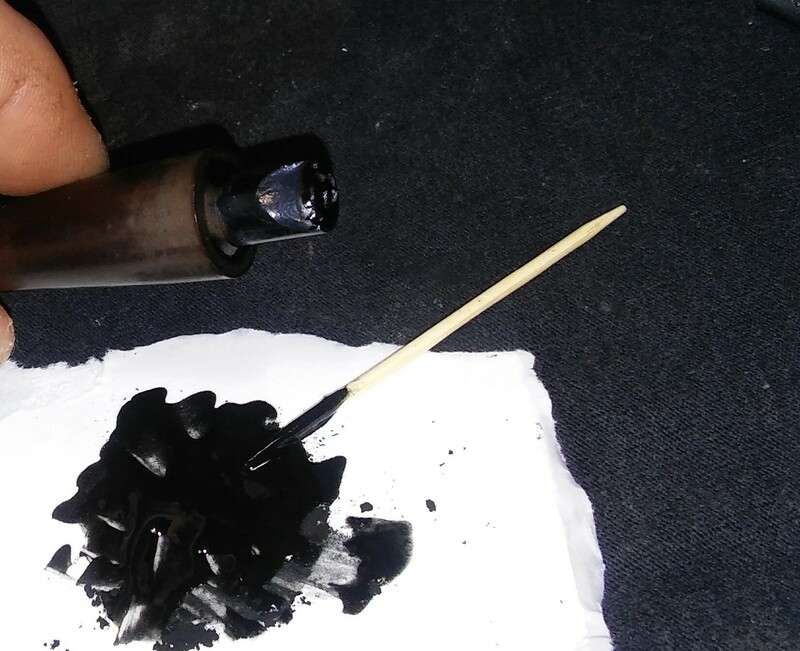 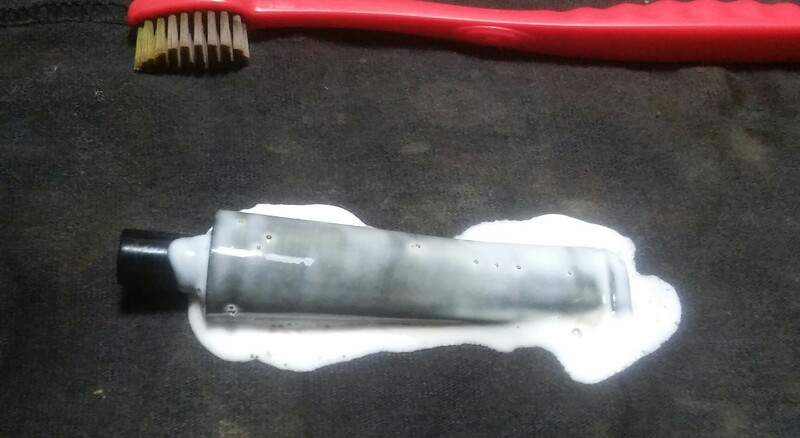 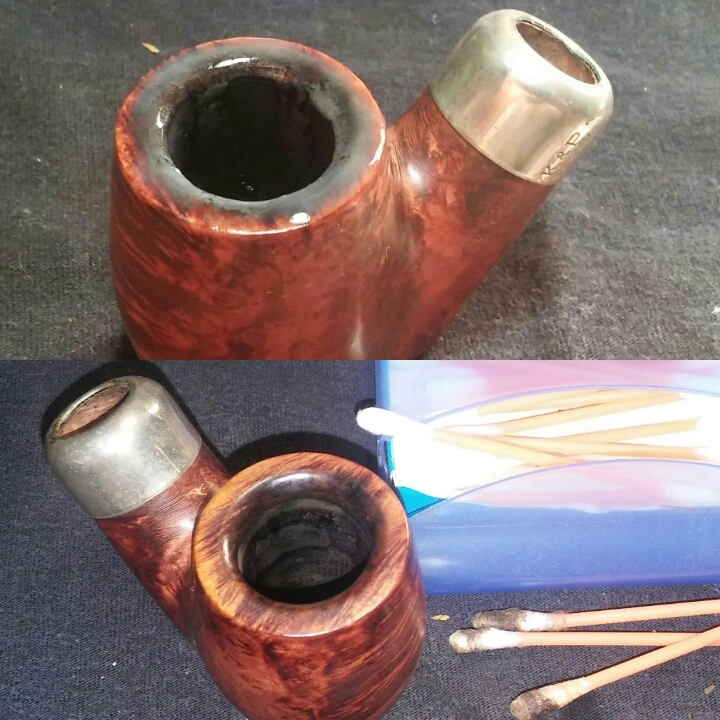 I had already begun removing the worn finish in my excitement starting with EverClear and then moving to acetone, I would normally ream the chamber first. 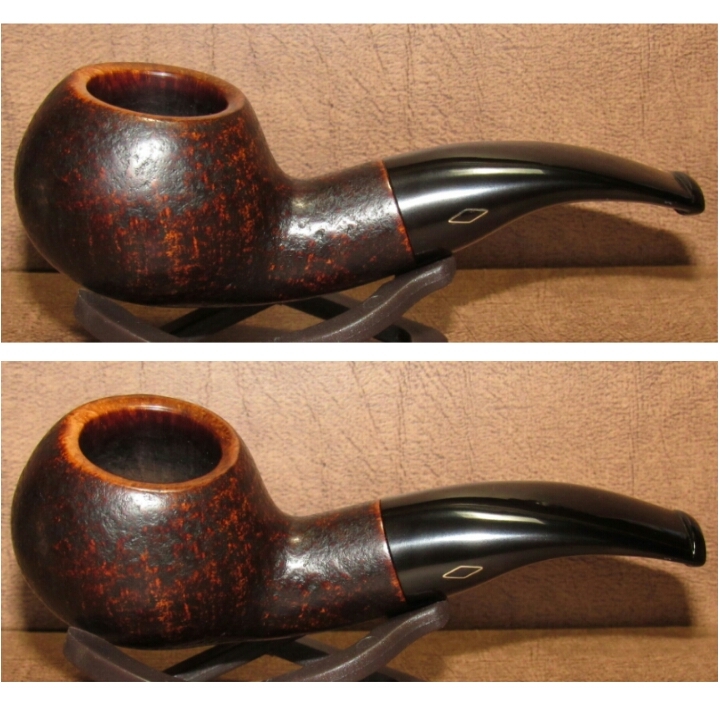 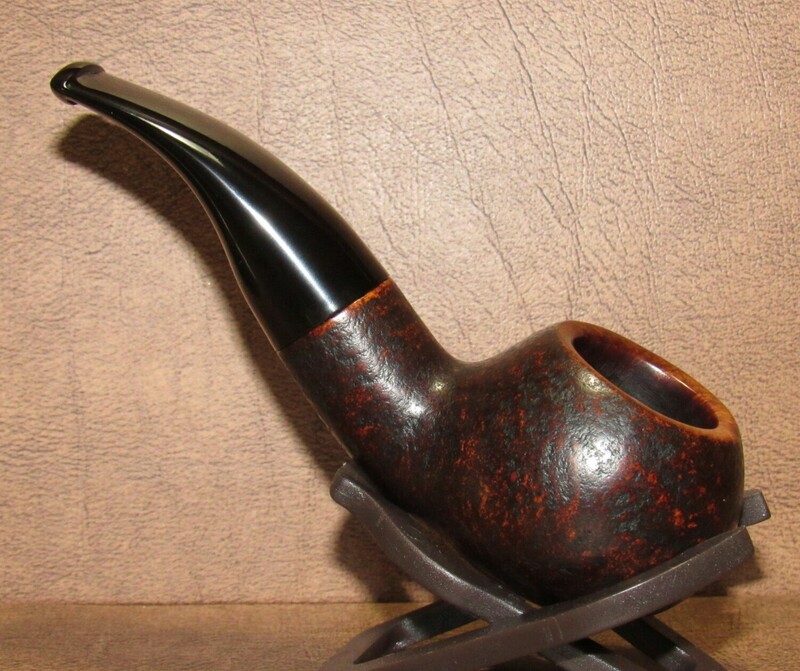 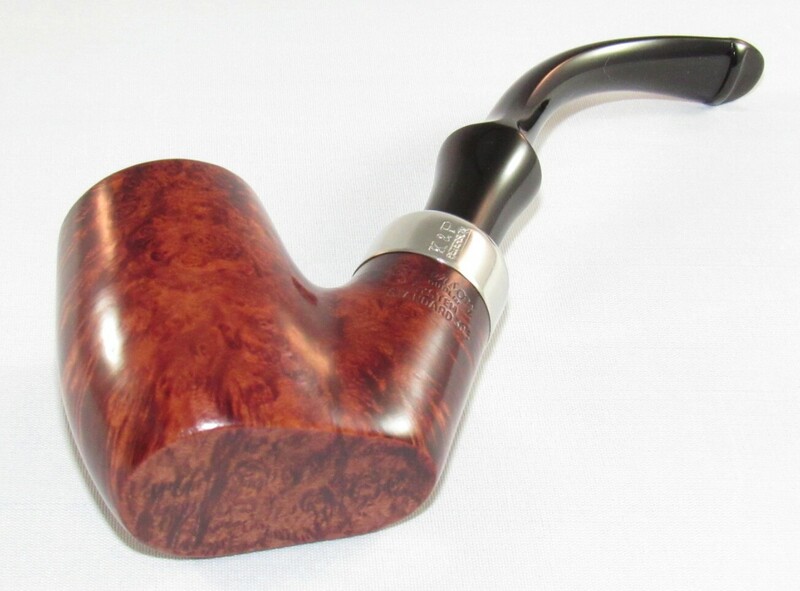 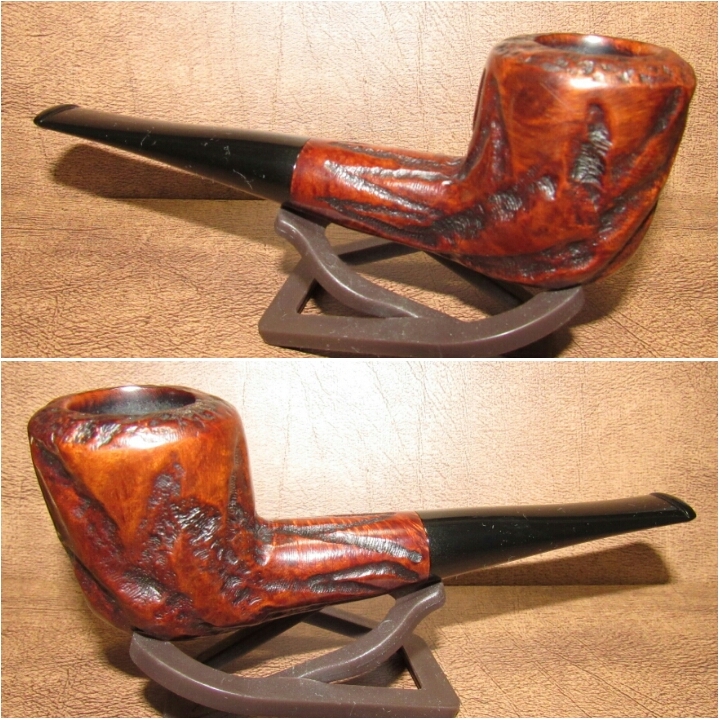 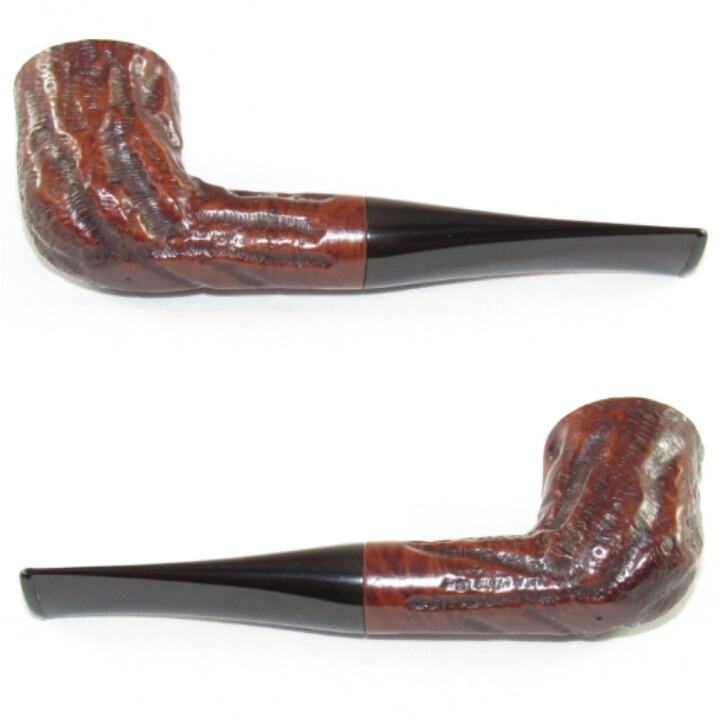 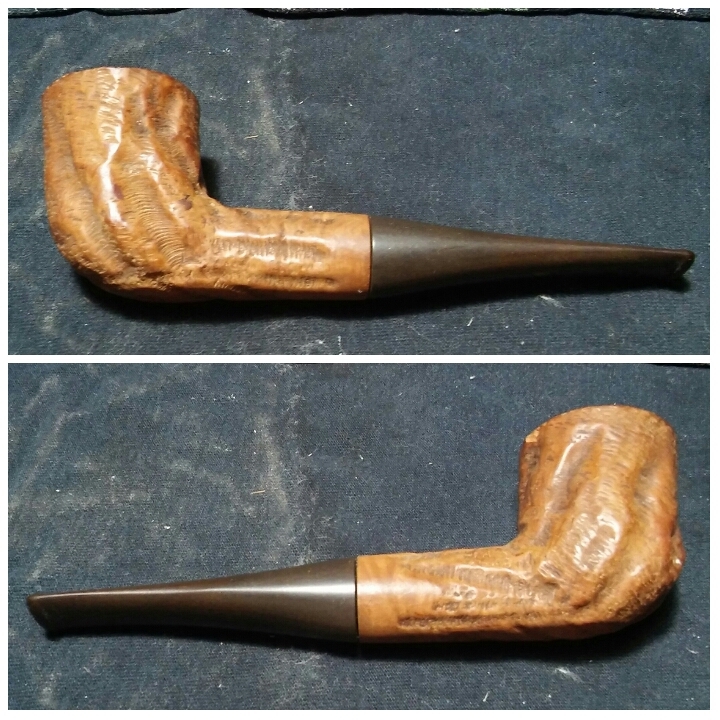 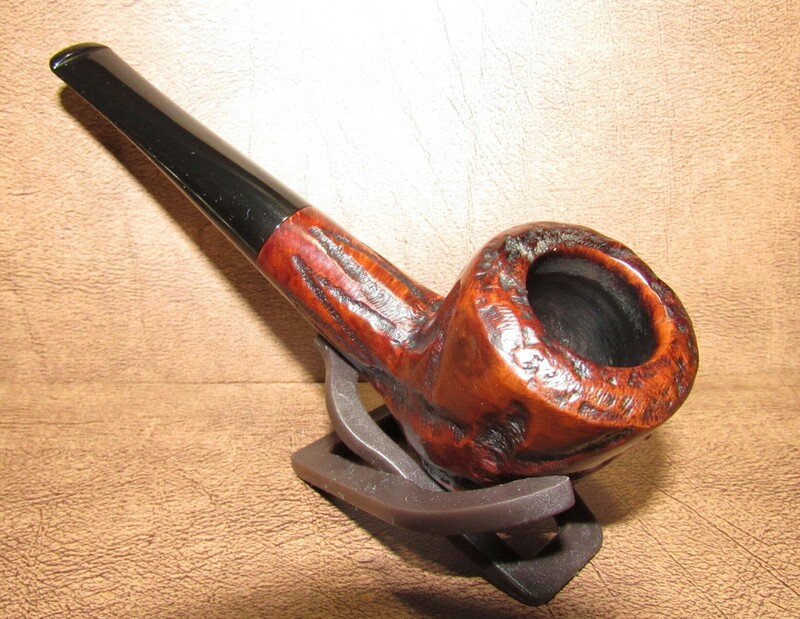 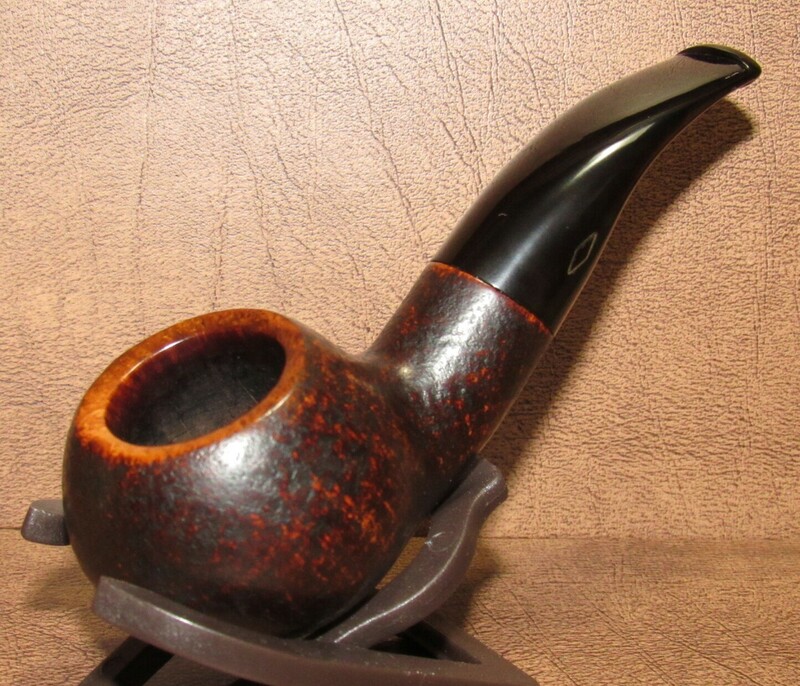 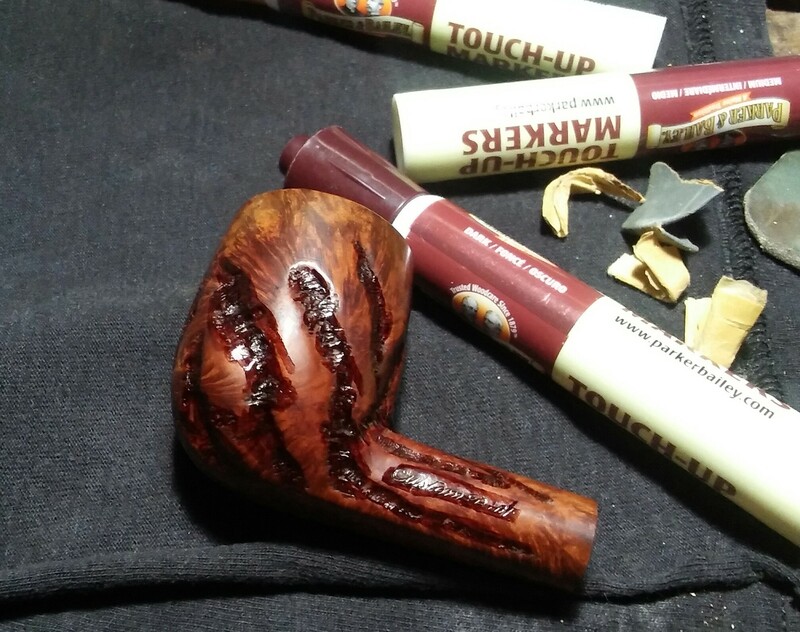 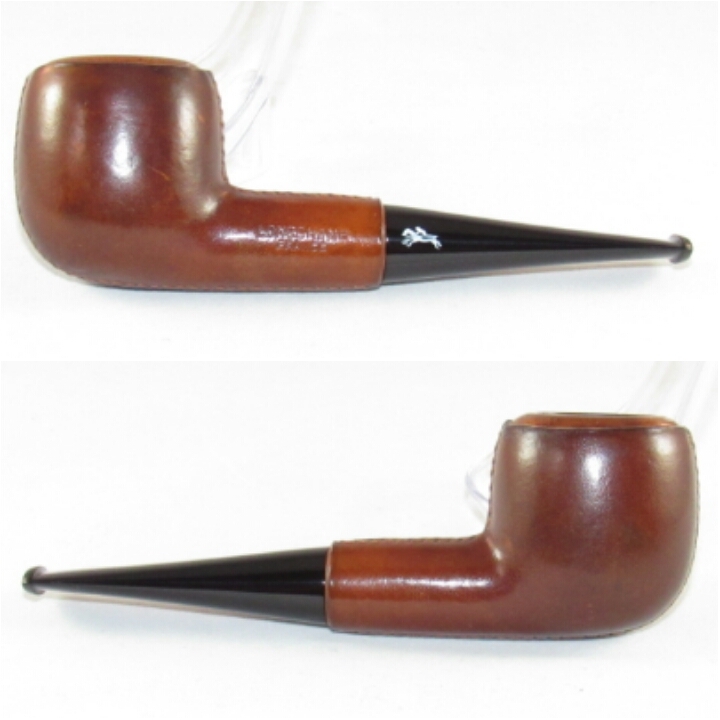 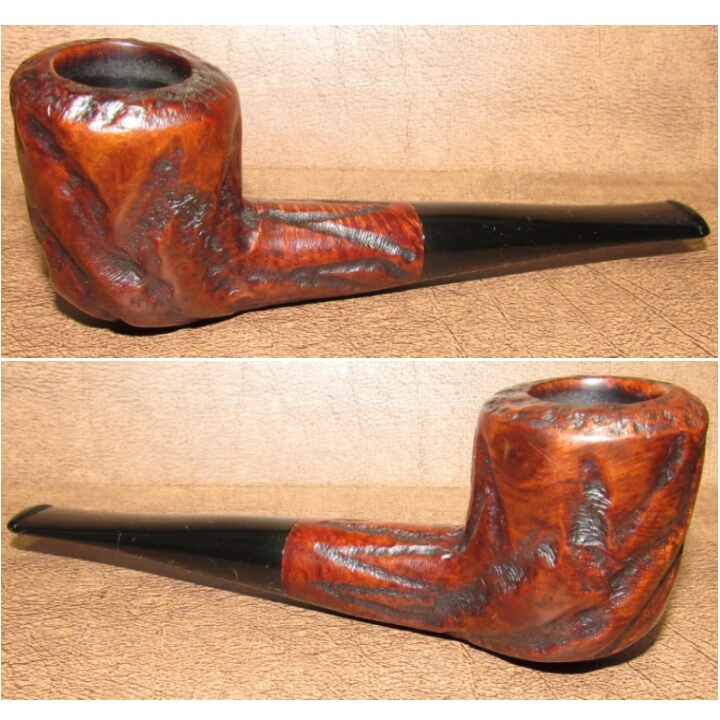 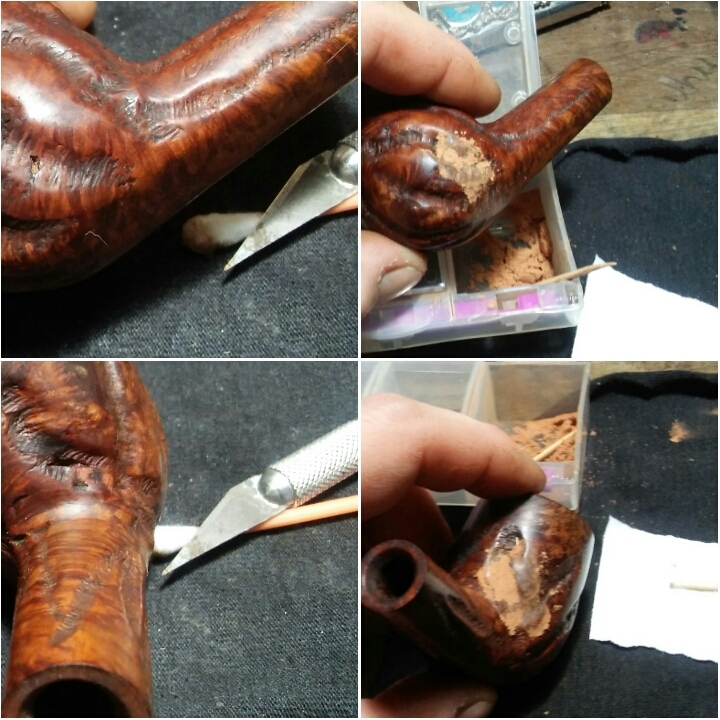 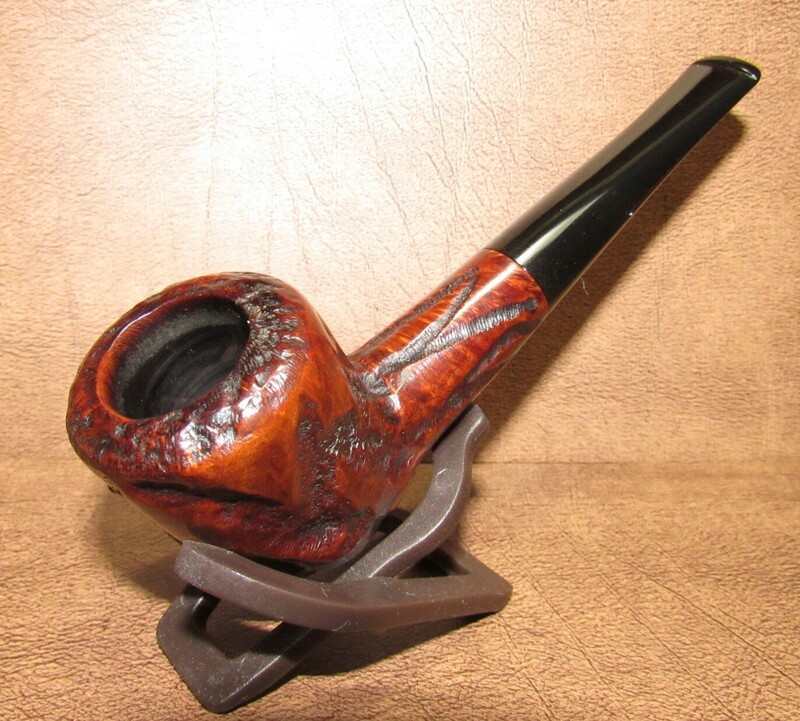 The chamber was reamed by the seller for the most part back to briar exposing the burn in the right side of the chamber. 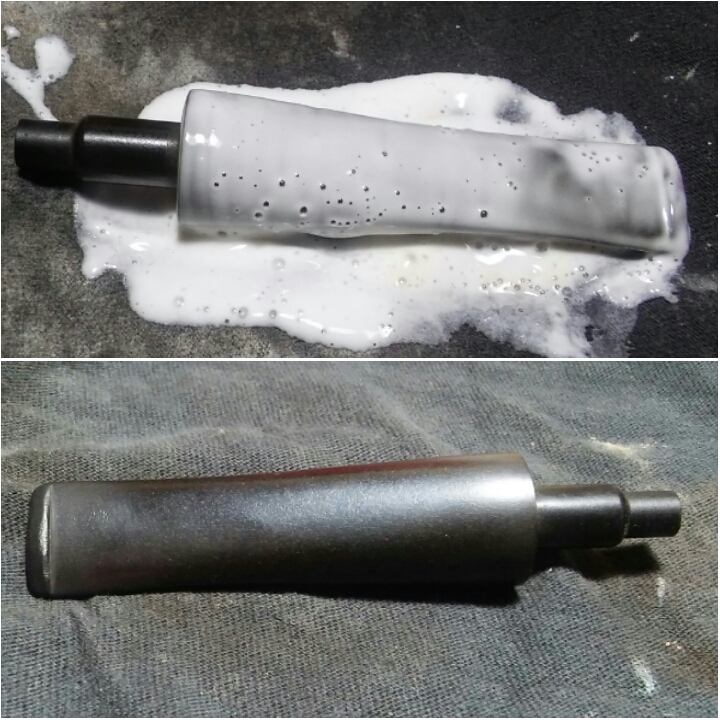 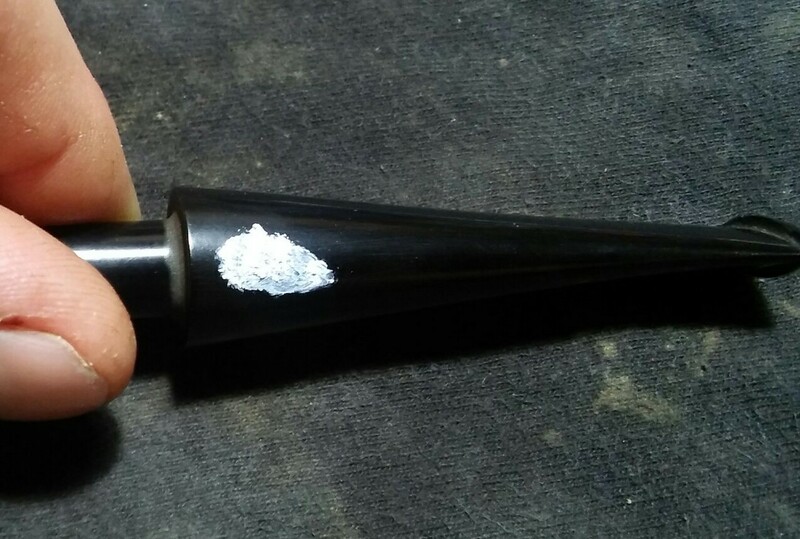 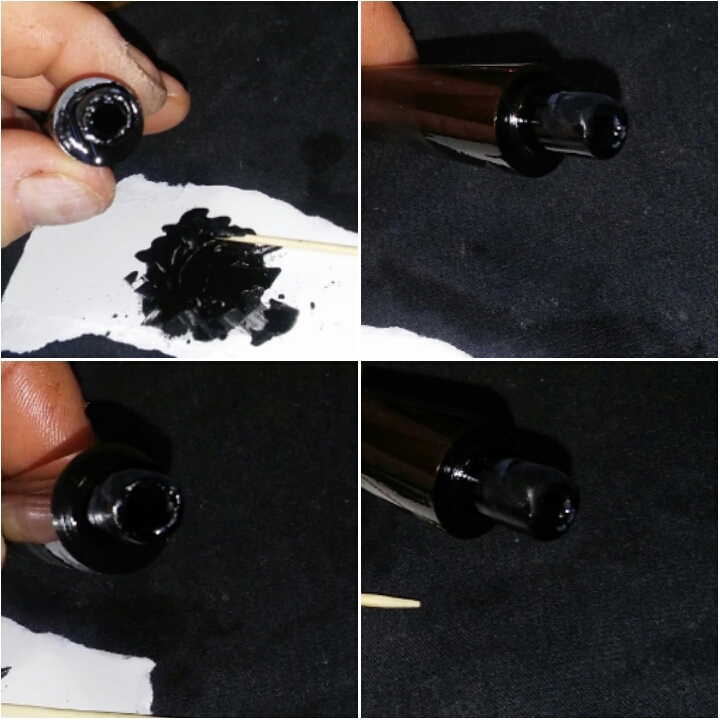 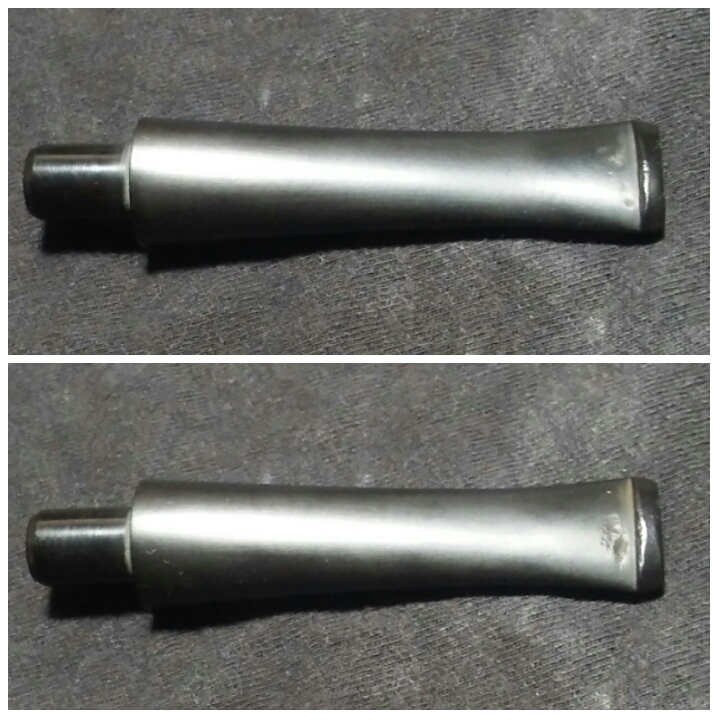 I sanded the chamber instead of reaming with 220 grit sandpaper and then 400 grit sandpaper, sanding the right side of the chamber and removing the burnt area completely. 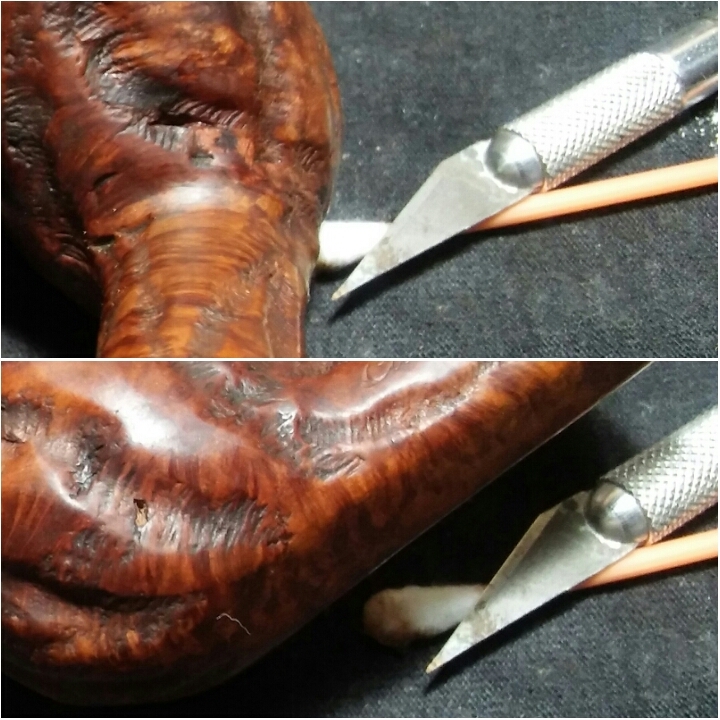 There was more than enough chamber thickness to do so. 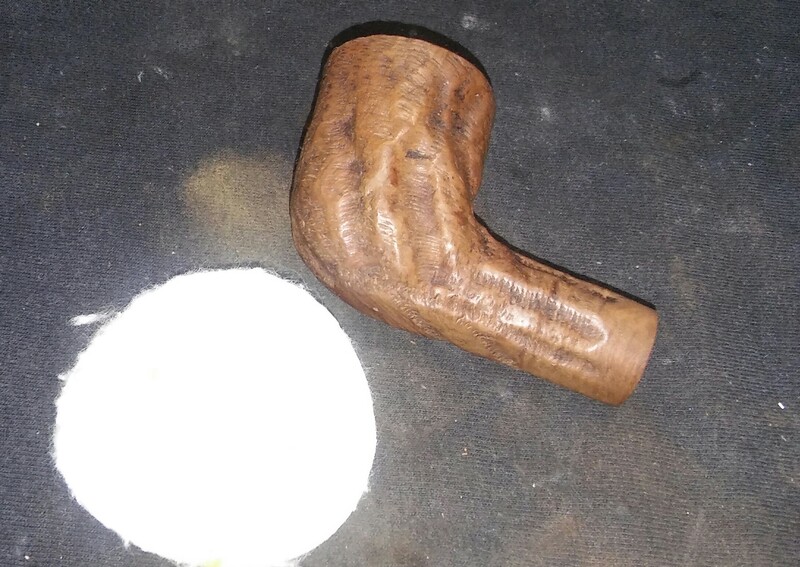 Next I moved onto the uneven rim. 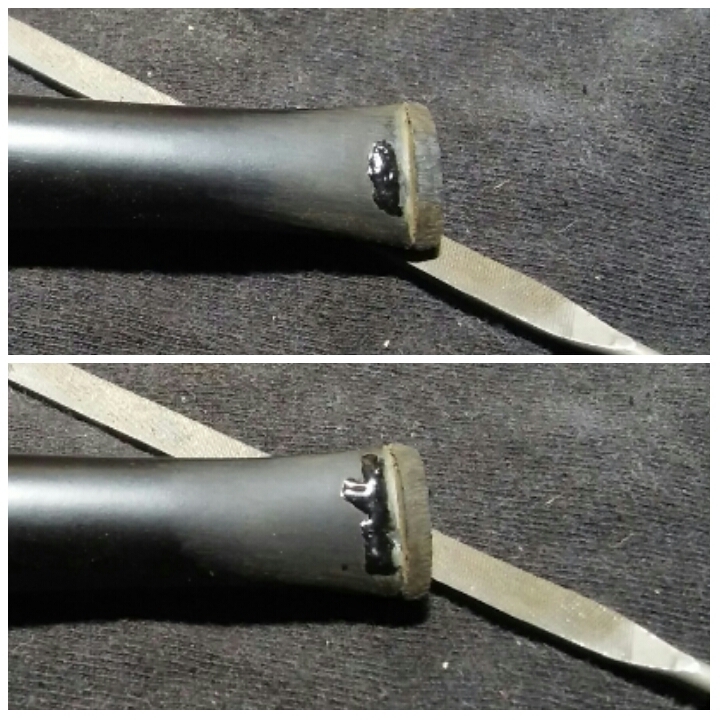 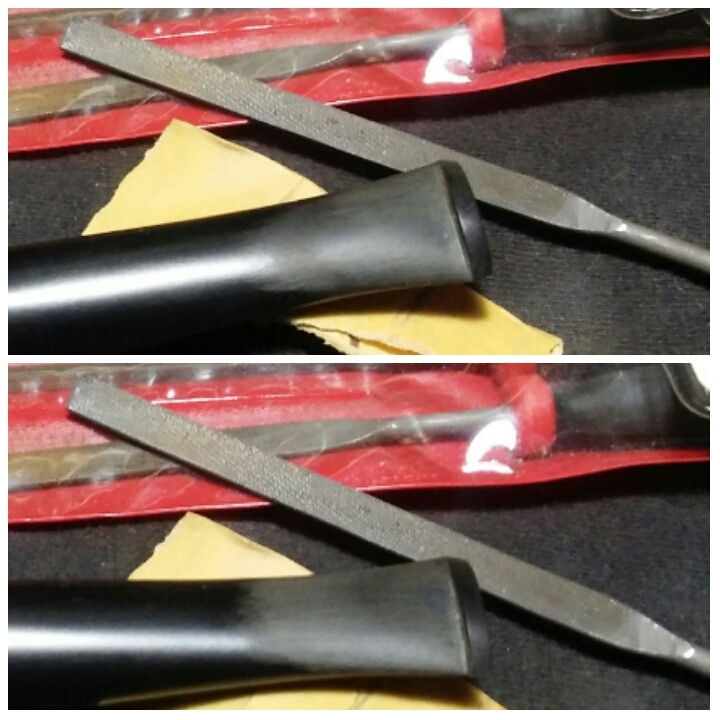 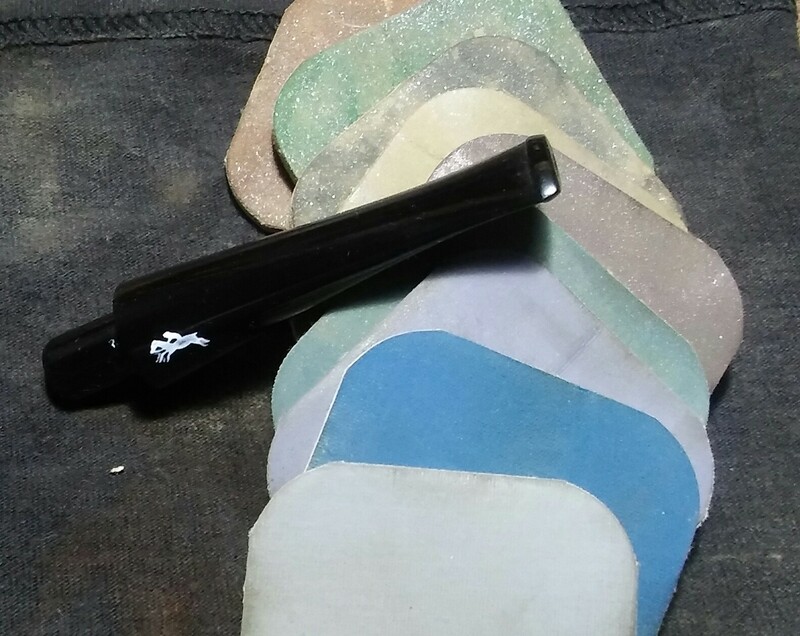 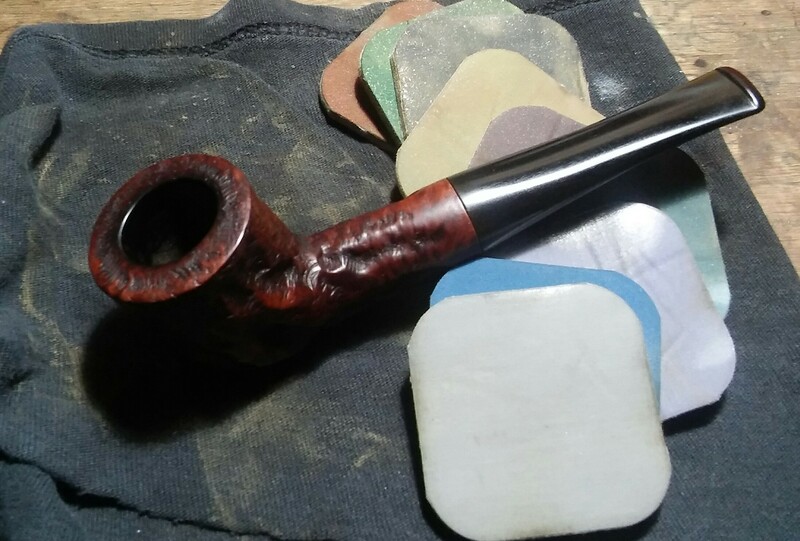 Using a round side needle file and 220/400 grit sandpaper I began reshaping the rim. 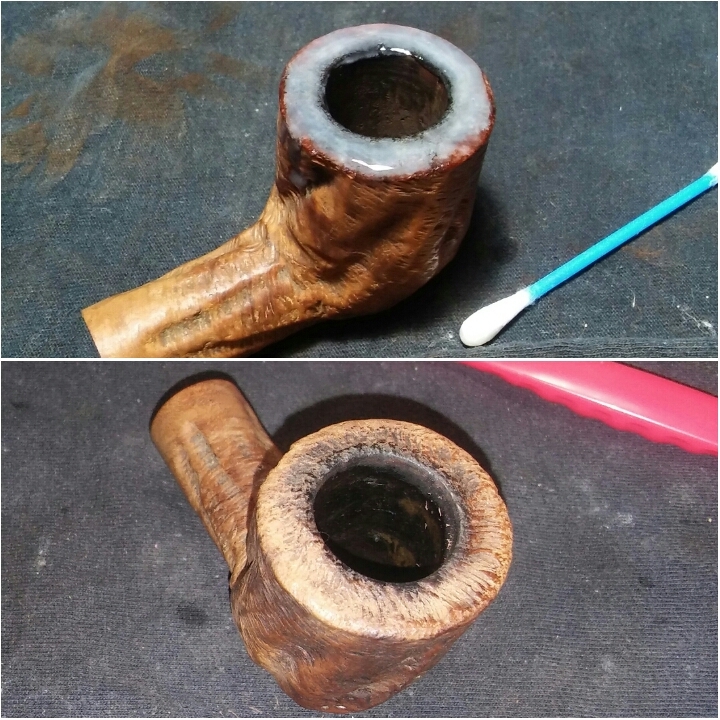 I decided the rim would pop more if it were smooth and natural, I sanded the rim with 400 grit sandpaper and finished with 800 grit sandpaper. 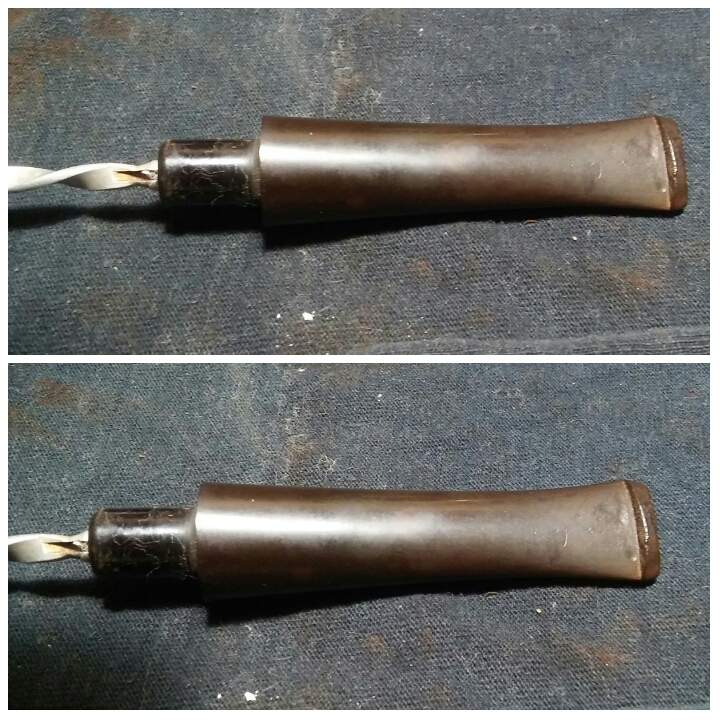 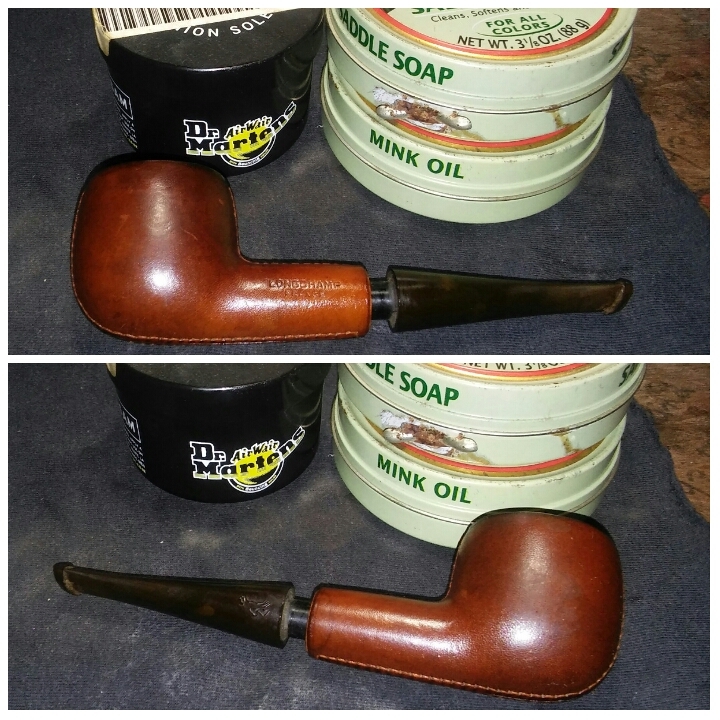 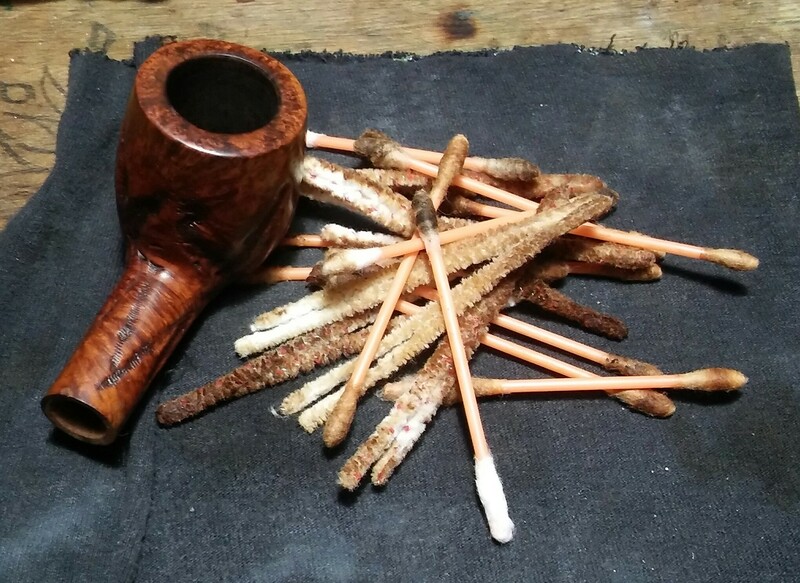 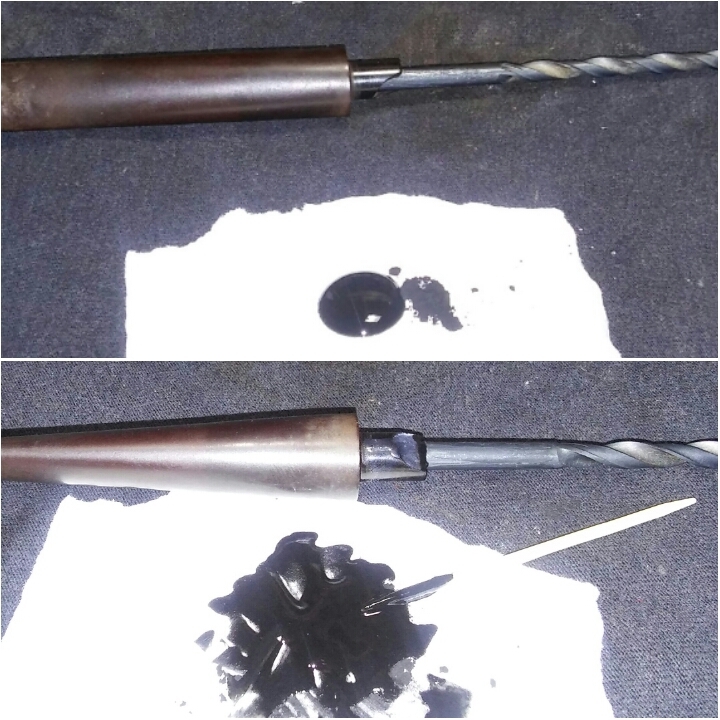 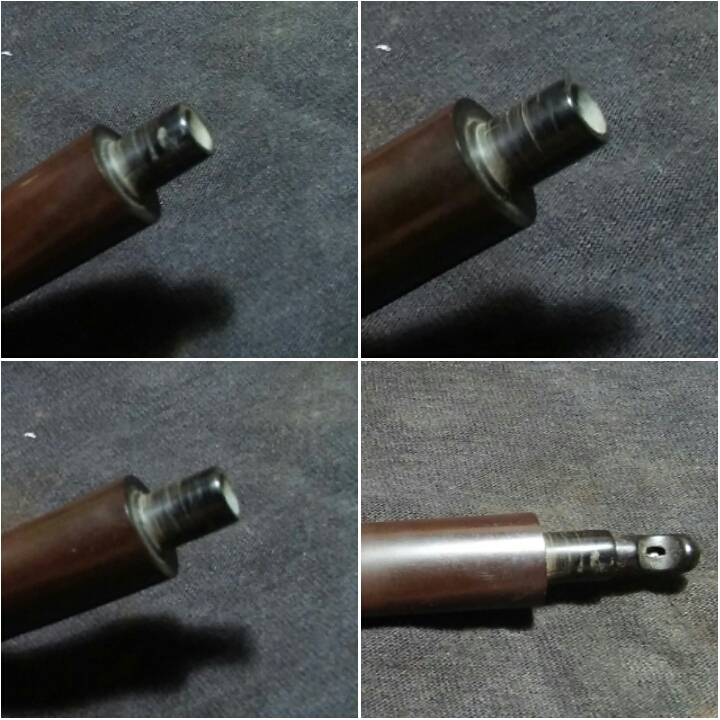 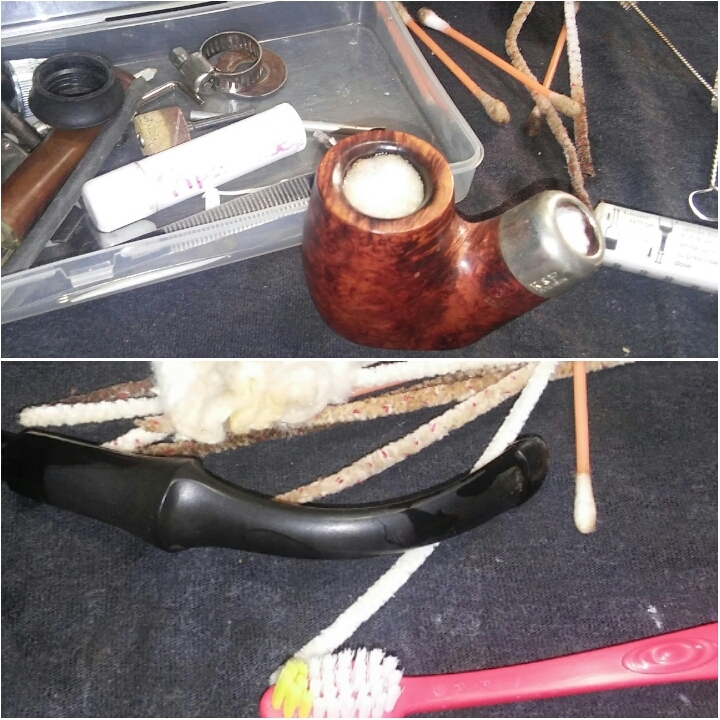 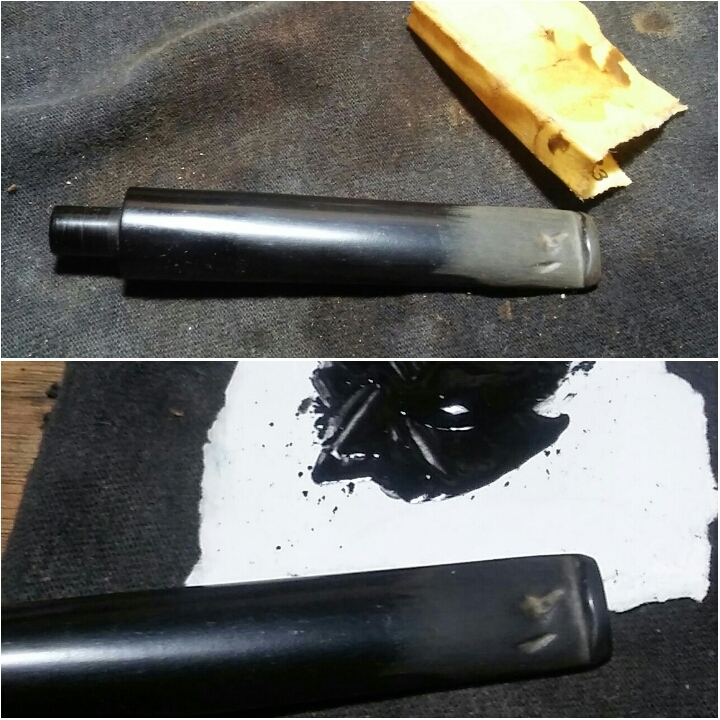 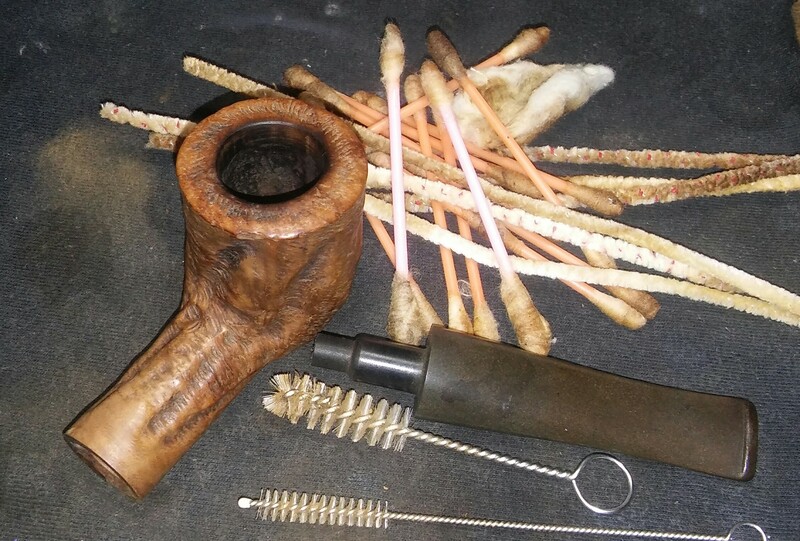 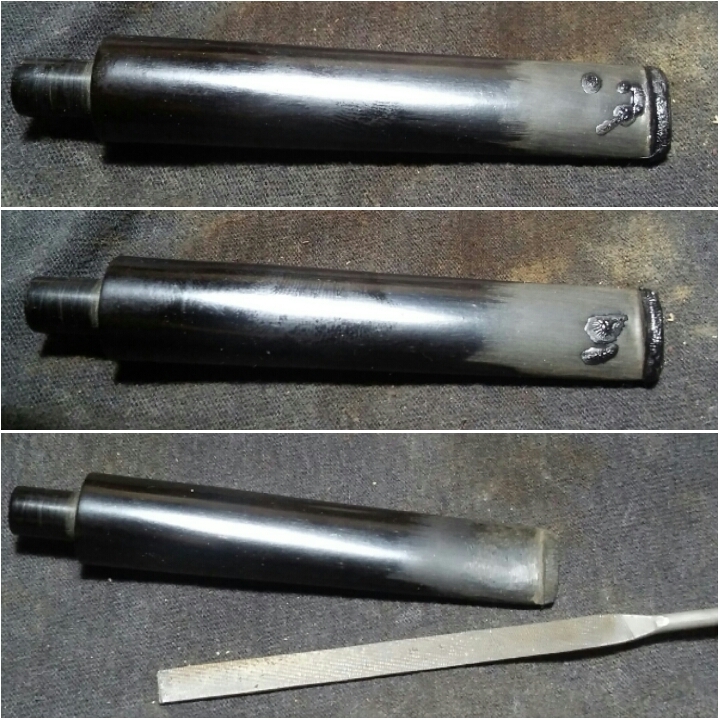 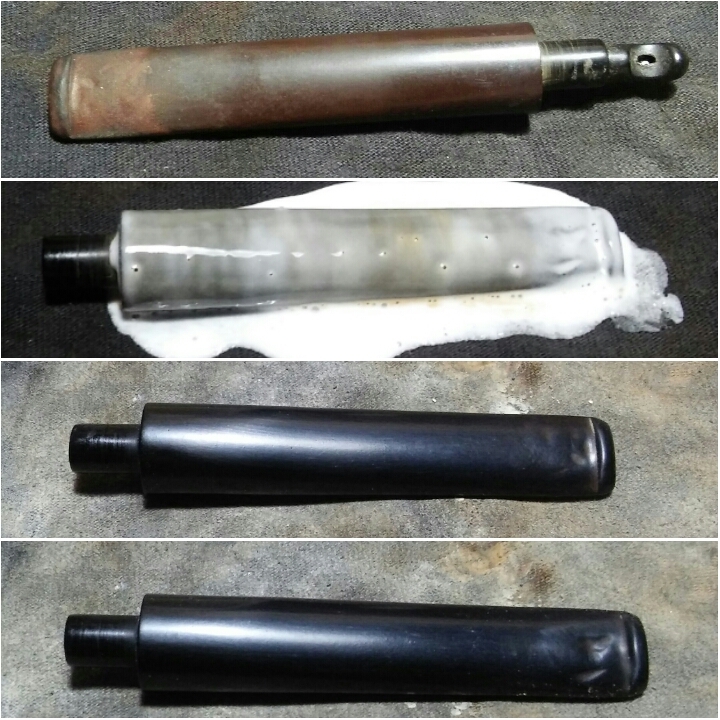 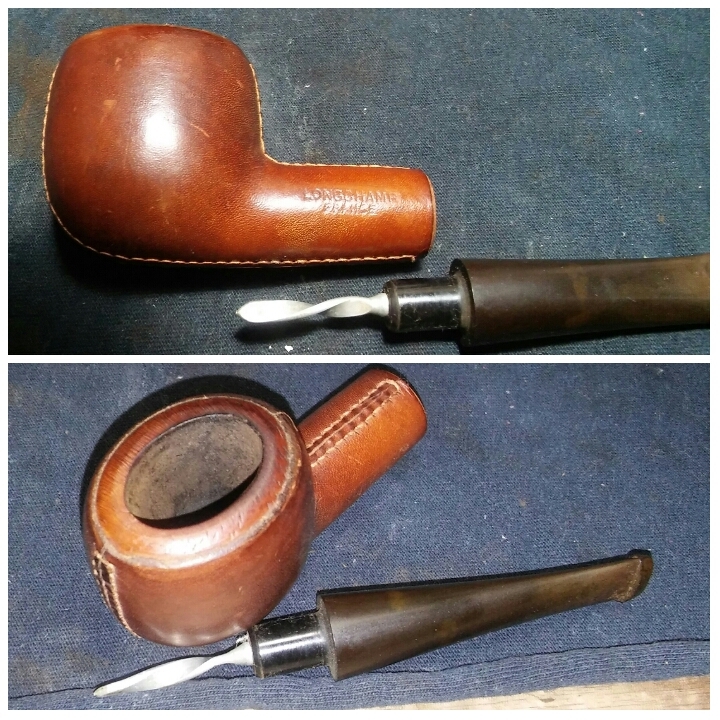 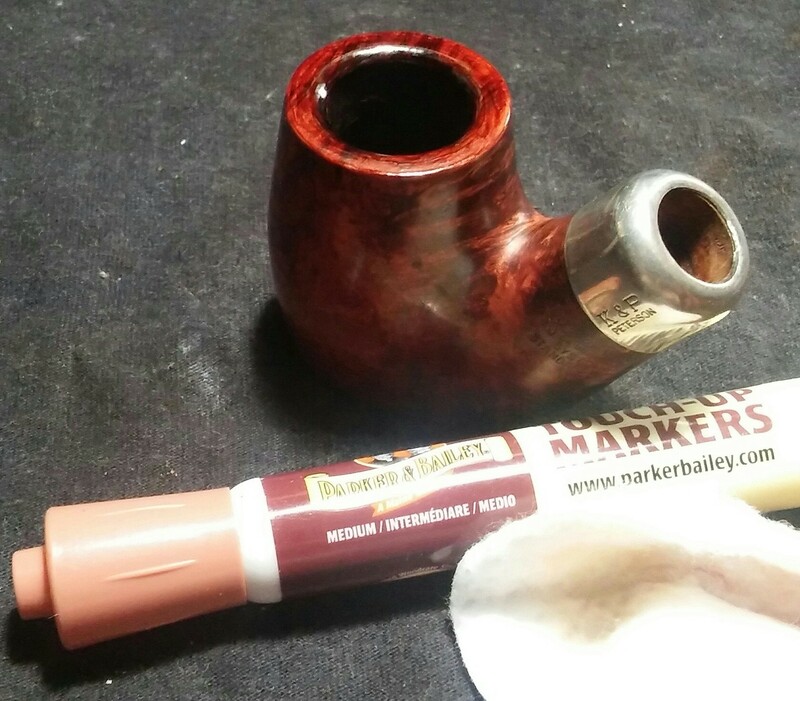 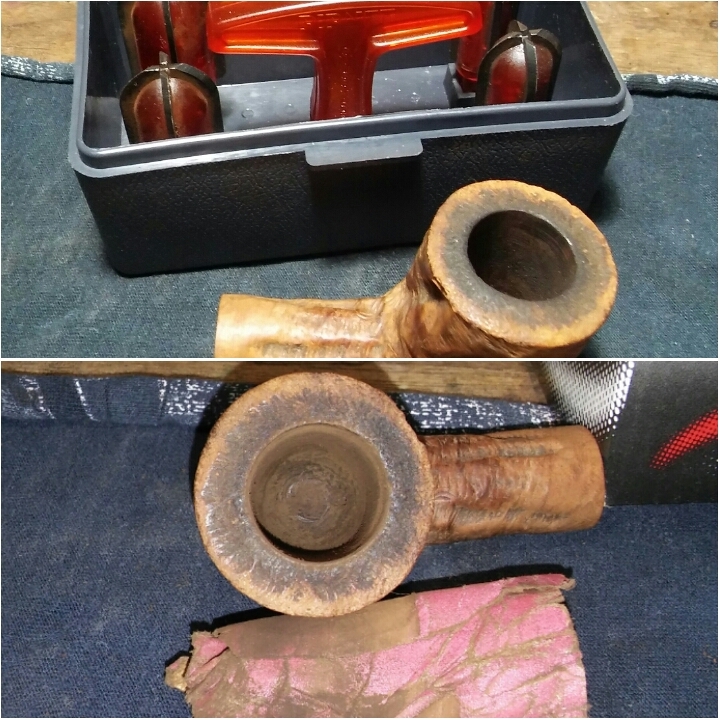 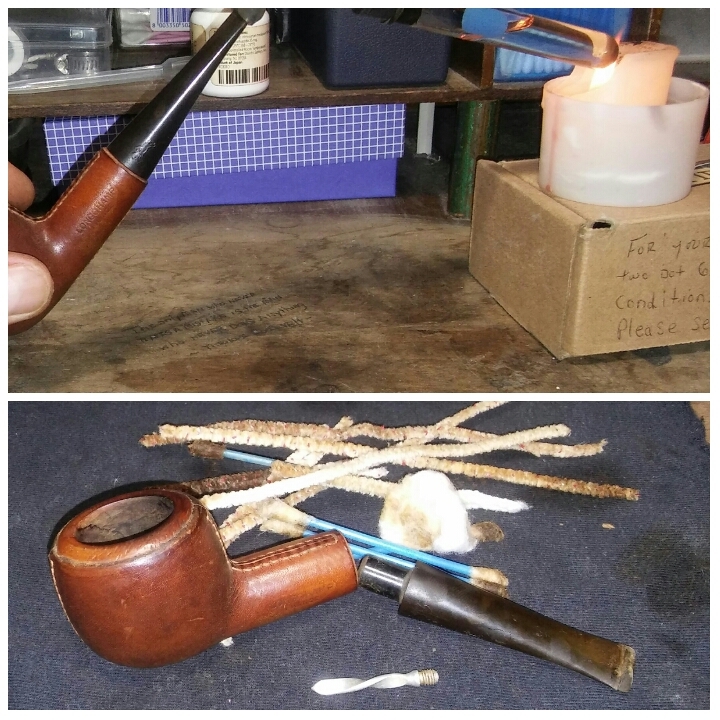 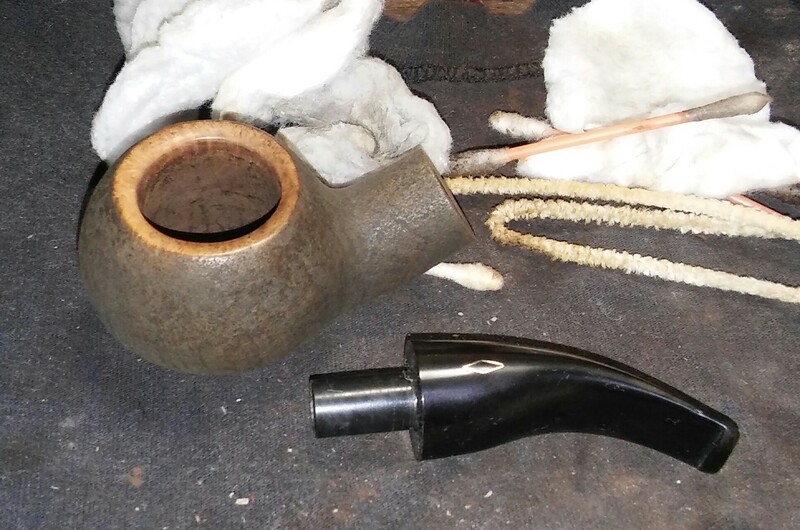 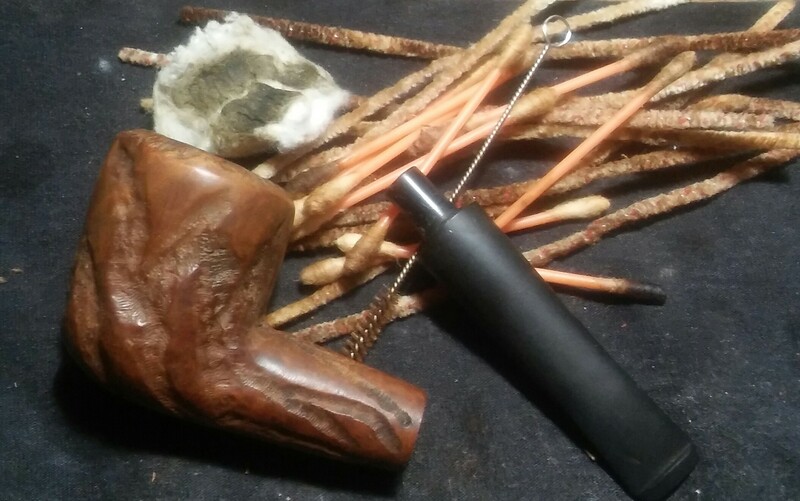 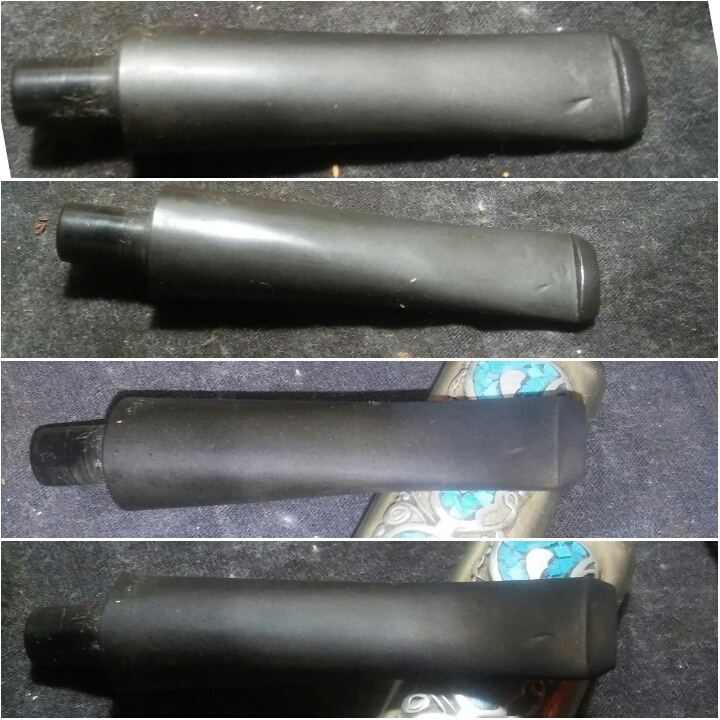 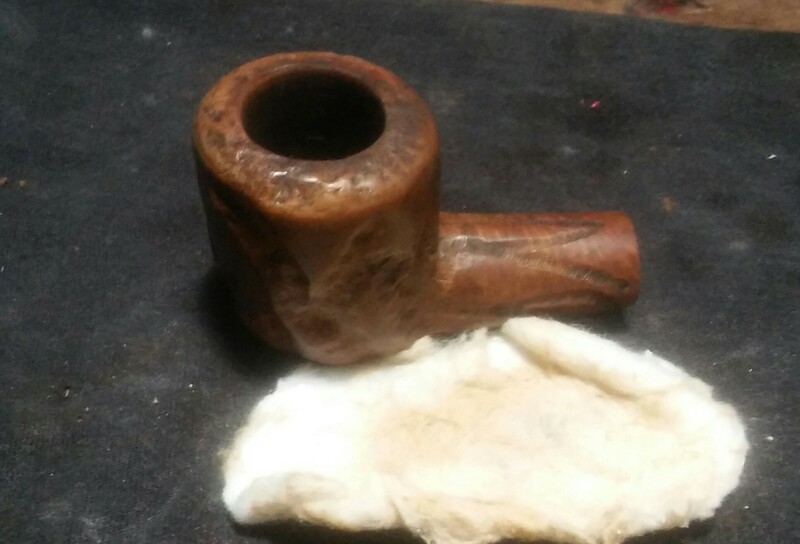 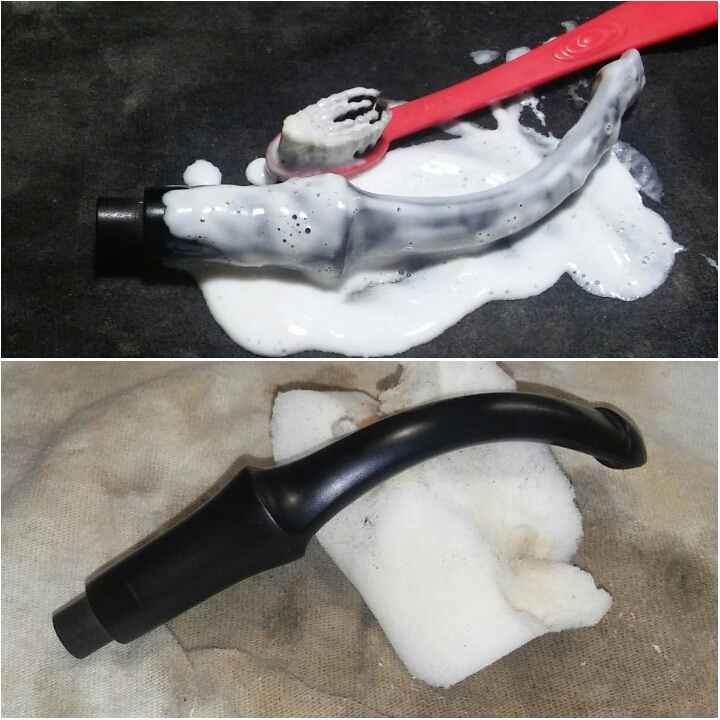 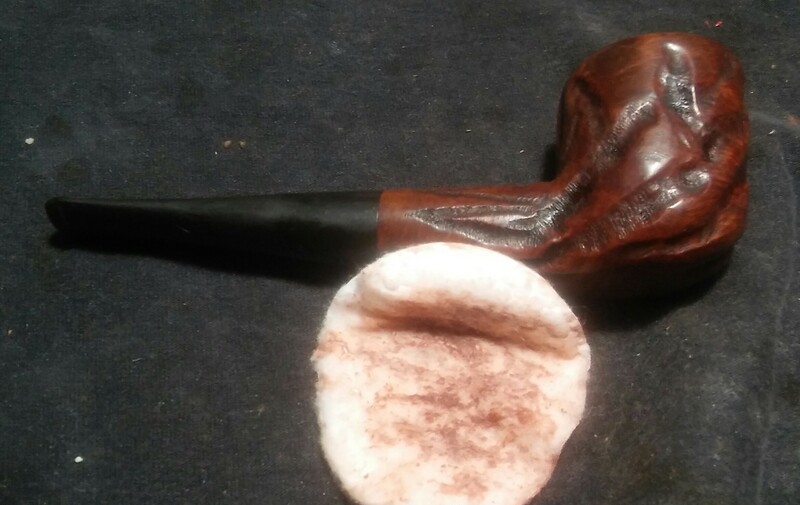 I now cleaned the internals of the chamber, mortise and stem with EverClear, Q-tips, shank brushes and stiff soft pipe cleaning until the pipe cleaners came out as they went in. 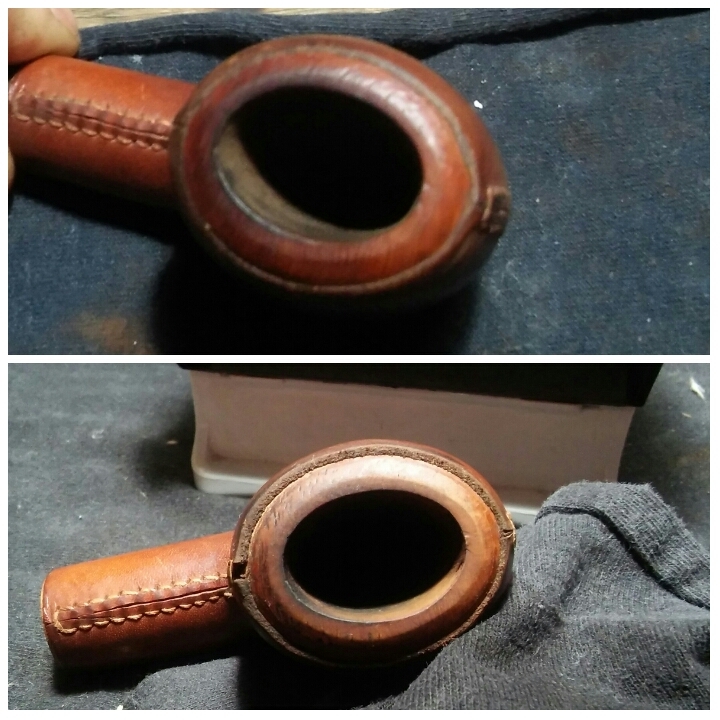 With the old Finnish removed I re-stainded the stummel with dark brown Fiebing’s leather dye hitting with a lighter to set the set the stain. 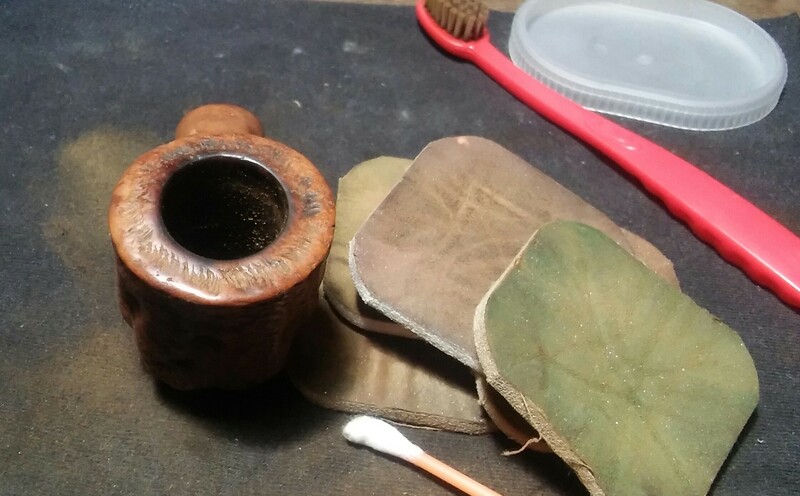 Now this is where I got over focused and did not take photos of my process. 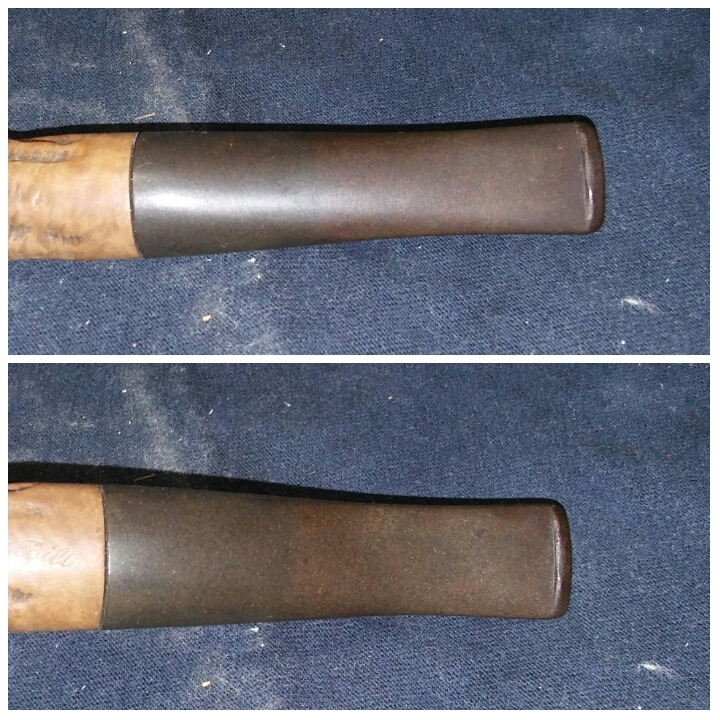 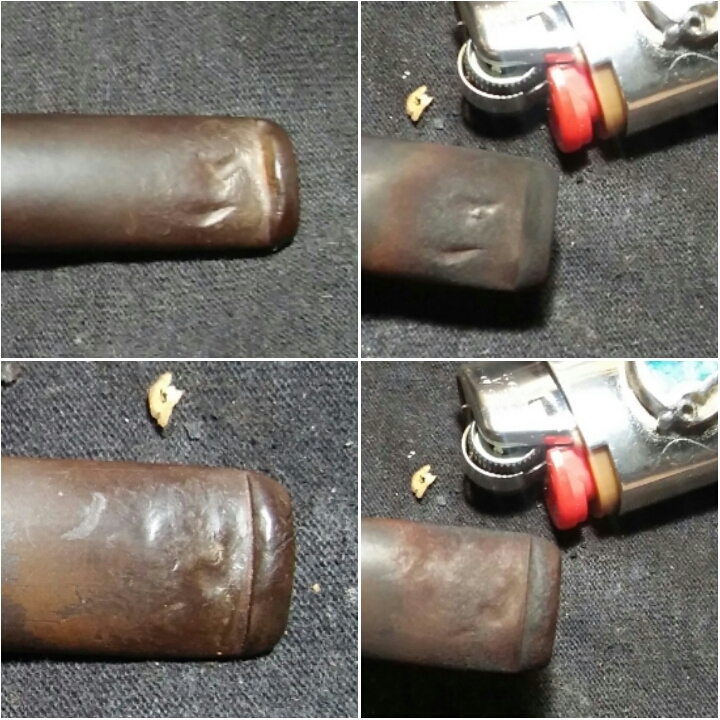 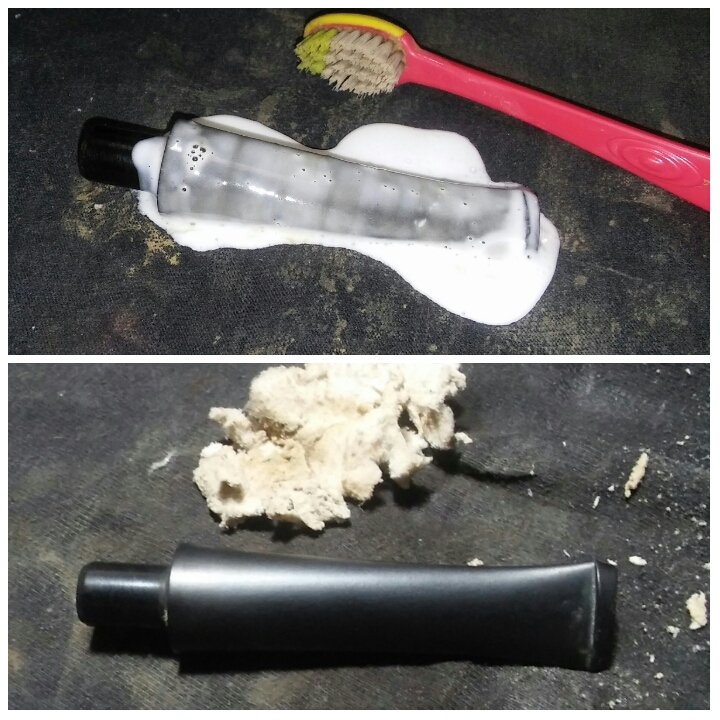 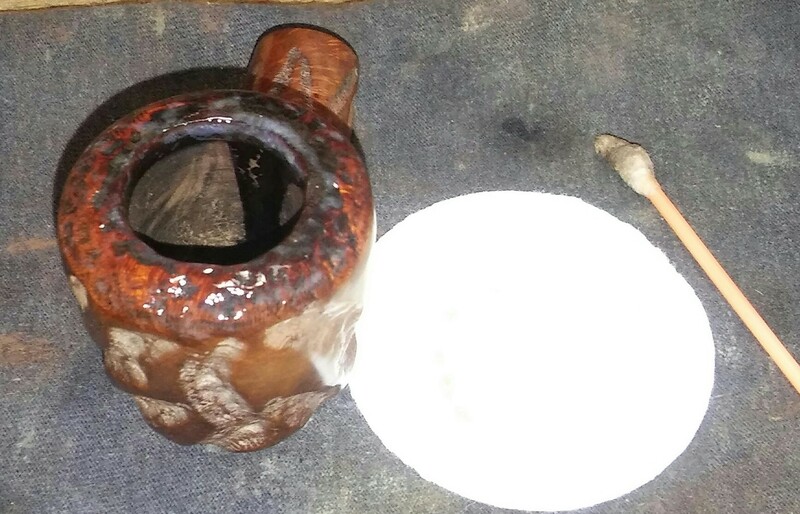 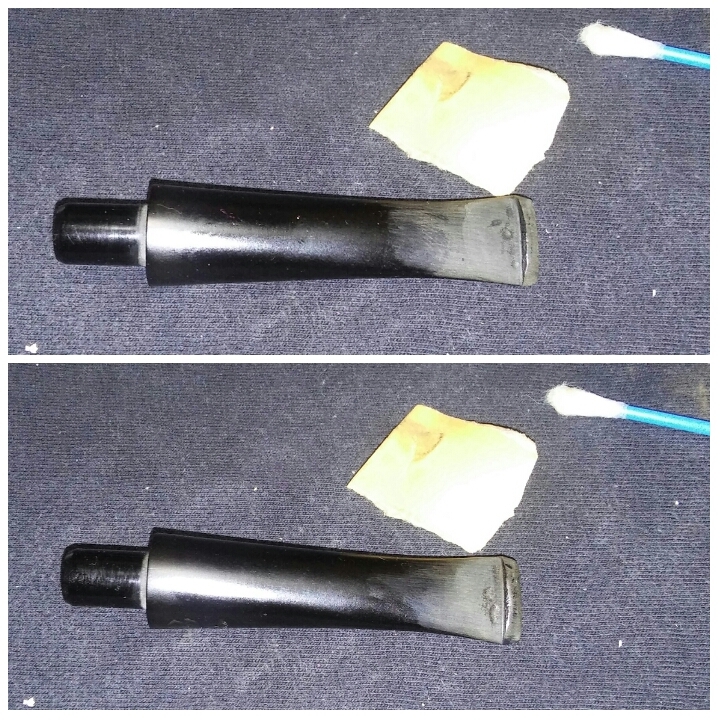 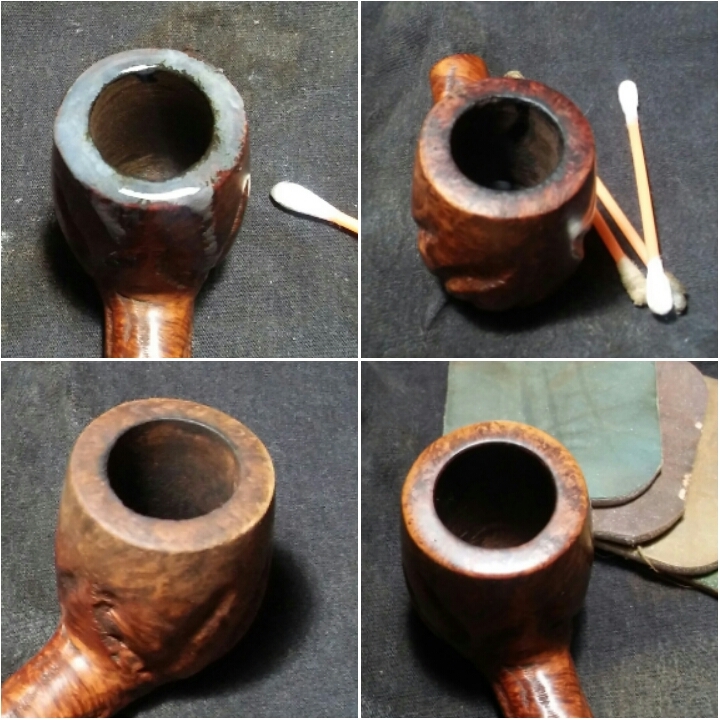 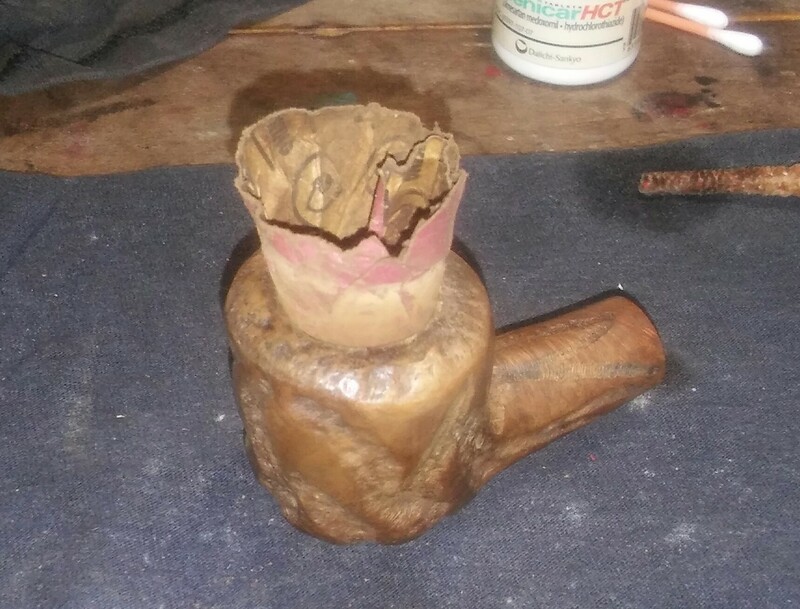 I removed the excess stain with an alcohol dampened rag and then sanded the high spots to lighten the stain, leaving the darker stain in the lower blasted areas of the stummel, wiping the stummel down with an alcohol dampened rag once more . 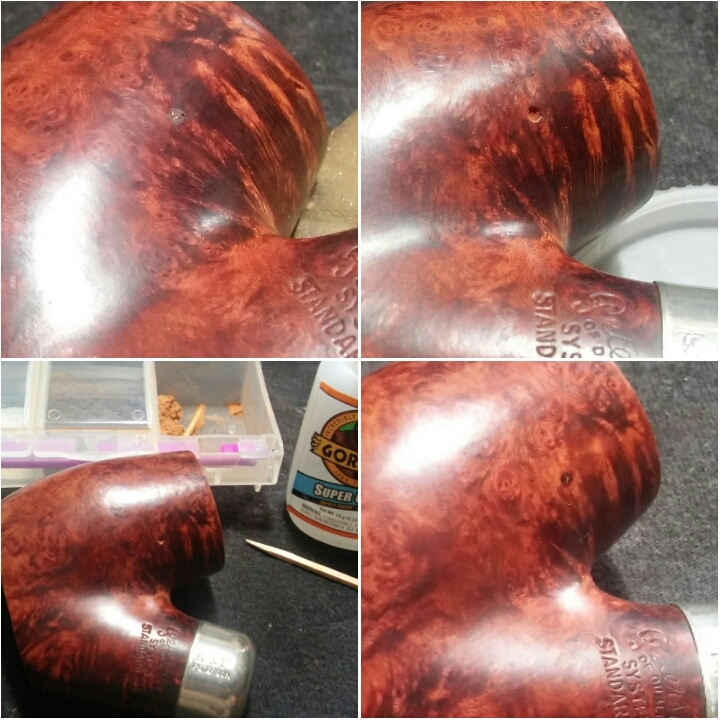 I gave the stummel a coating of Howard’s butcher block conditioner before hitting the wheel, removing the excess with a clean rag. 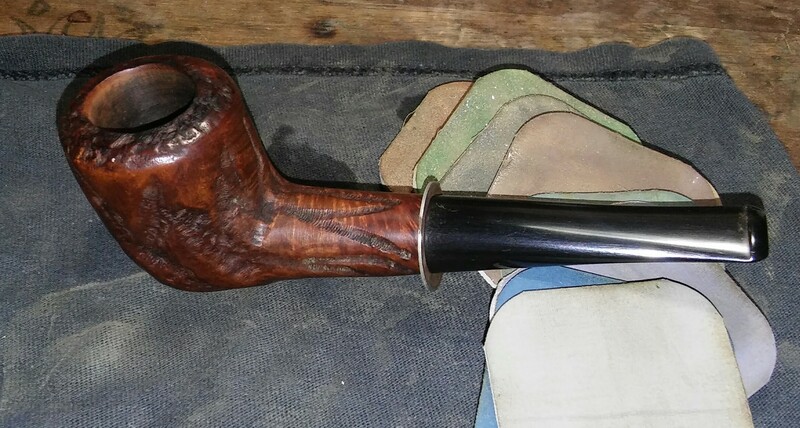 Now with a beautiful 54 degree February afternoon in N.Y. I’ll sit and enjoy my work and celebrate my wife’s birthday as well. 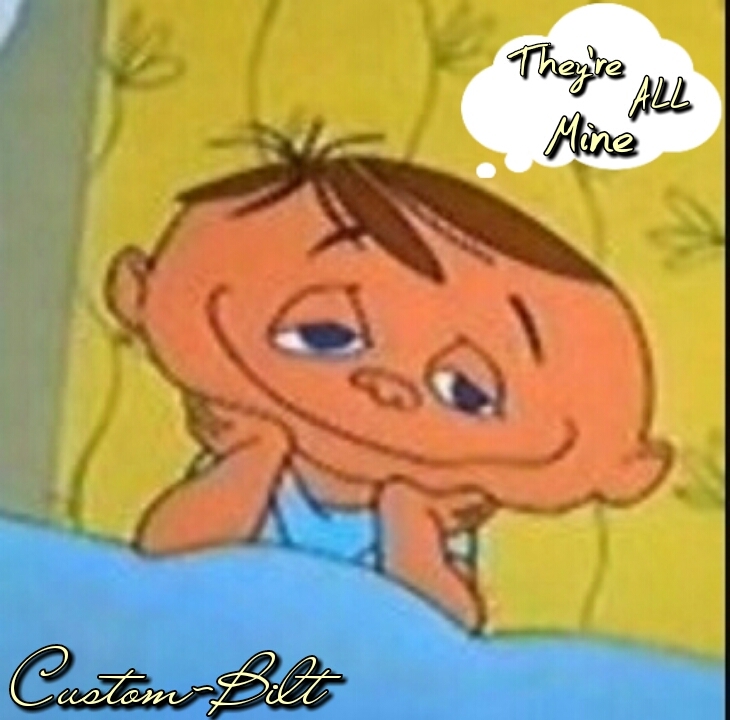 Keep your chambers full and your hearts happy. 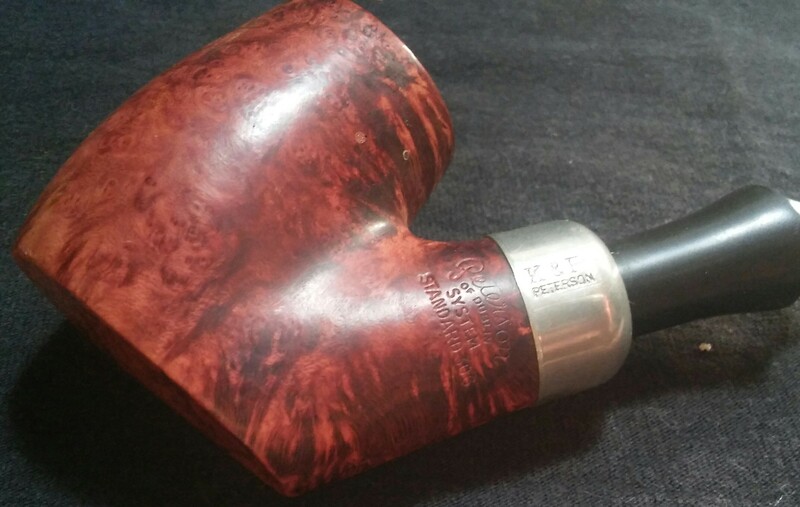 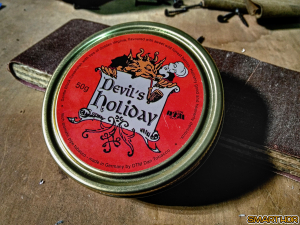 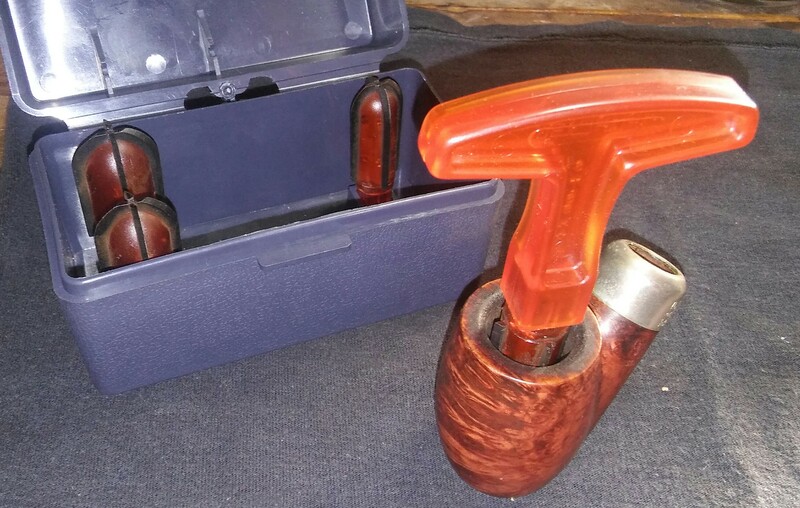 An impressive piece of work from Clint of http://pipescoundrel.com . 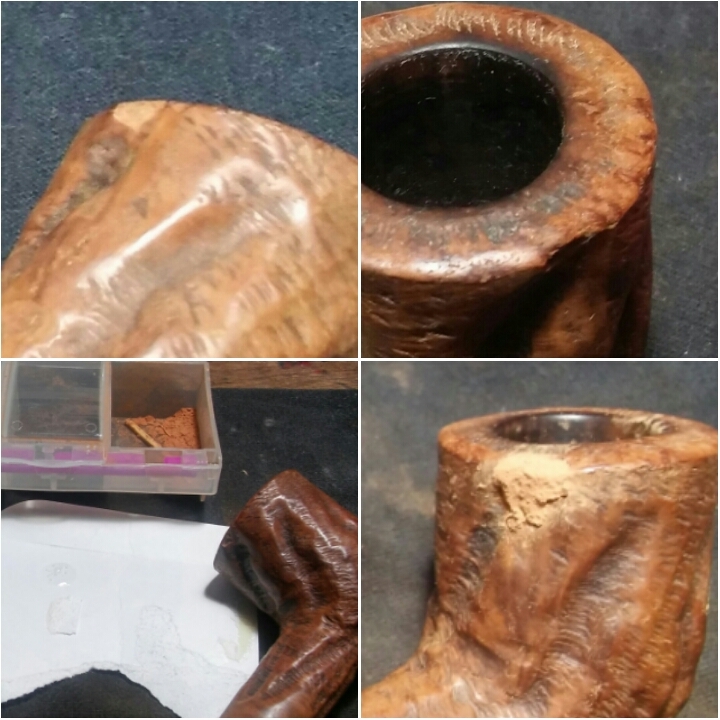 Check out his blog to see his work from conception to completion. 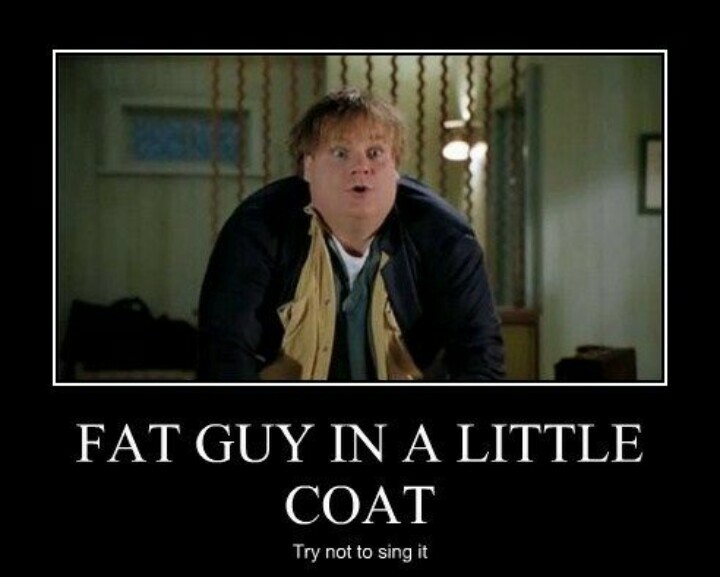 Looking forward to seeing more from him. 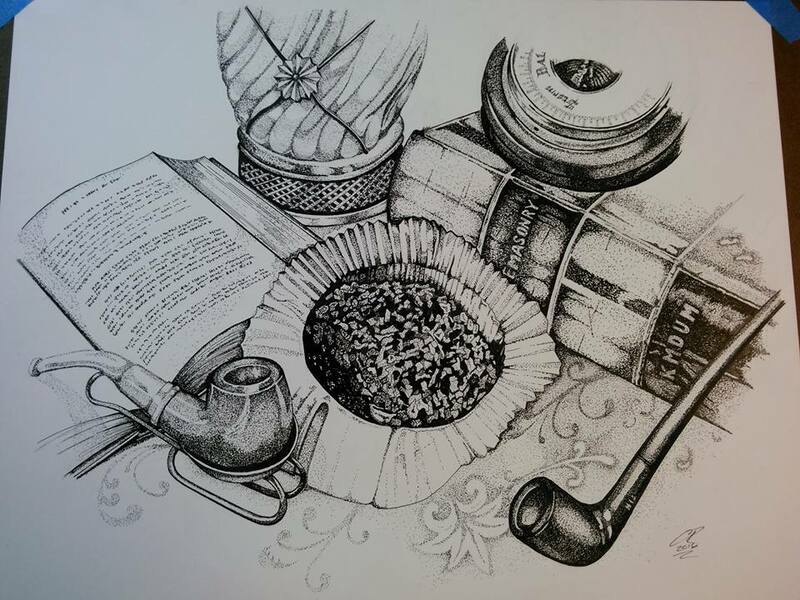 Well here it is… The final product of about 20+ hours of drawing dots. 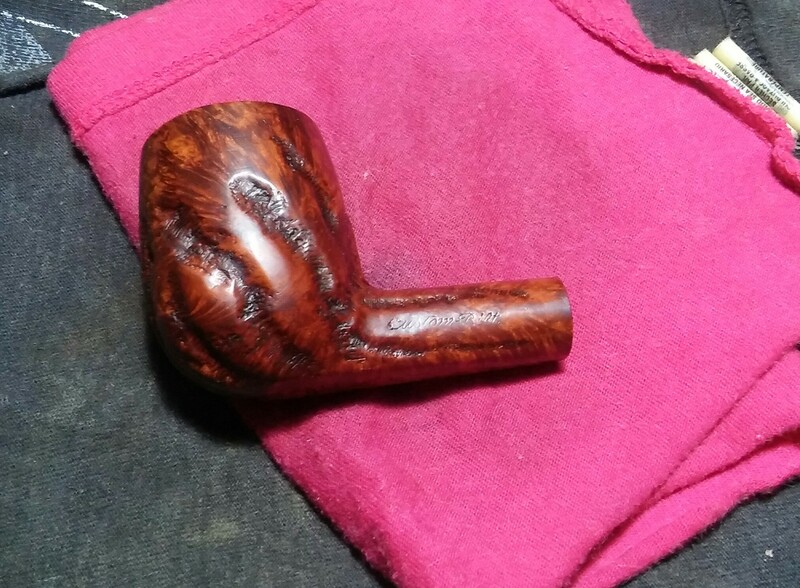 After having been away from doing anything “artistic” for a number of years I think it turned out pretty well. 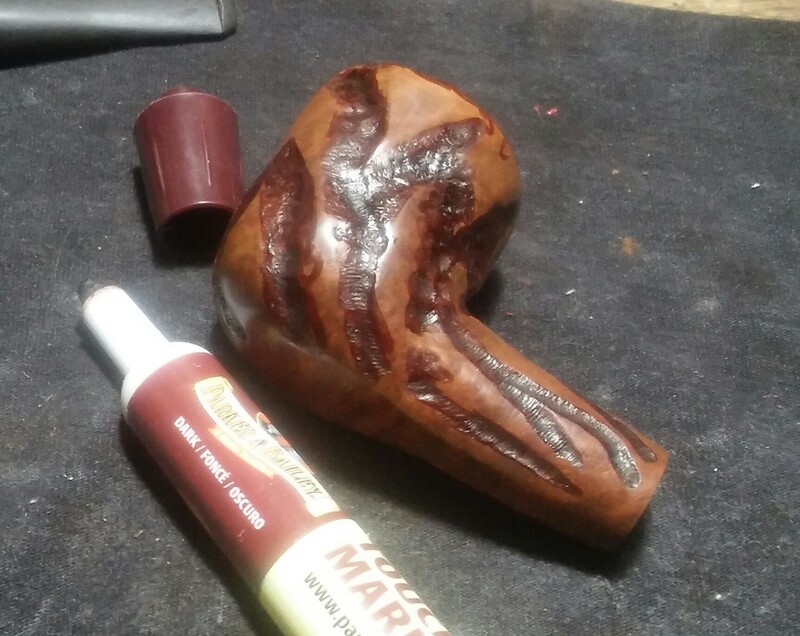 I had a lot of fun with this one and I’m already starting on my next project. 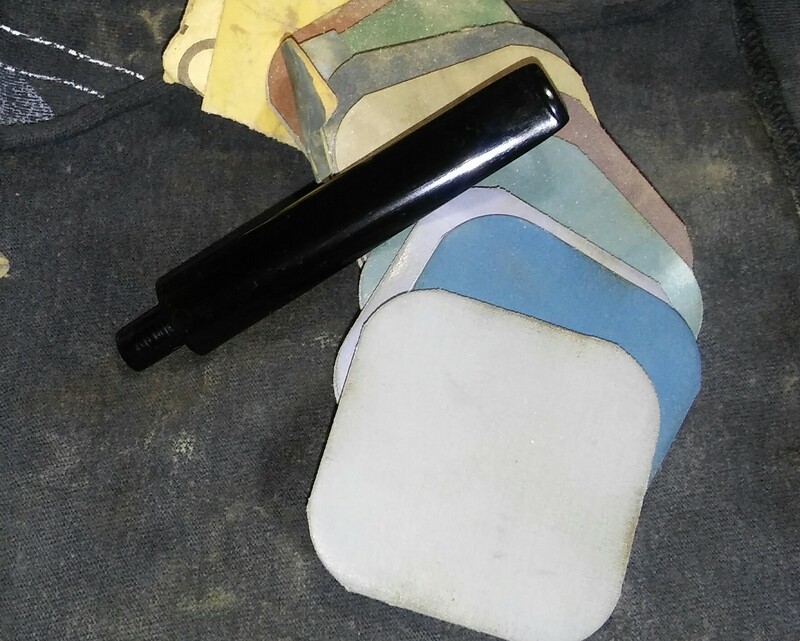 I’m hoping in the next few months I can also sit down with some oil paints and see how much I’ve forgotten about that as well. 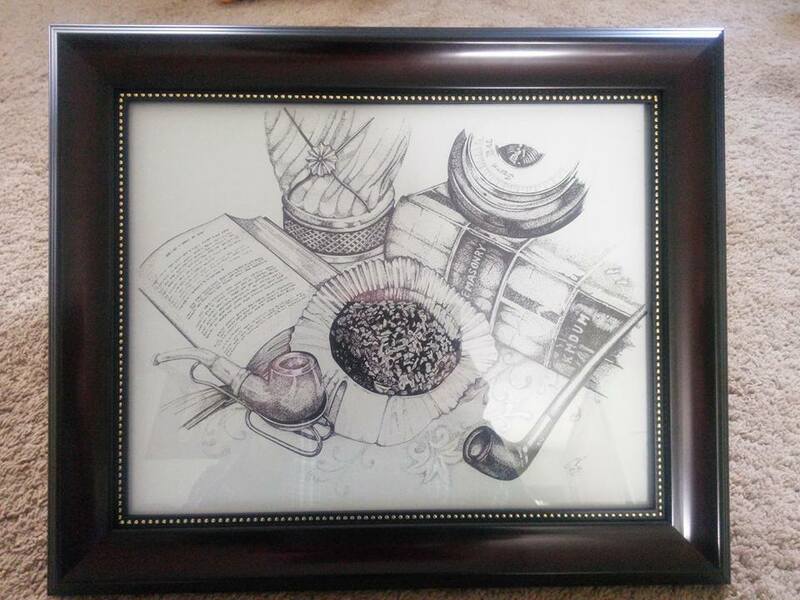 I picked up a frame for this over the weekend and despite the crappy picture it looks pretty damn nice in the frame if I do say so myself. 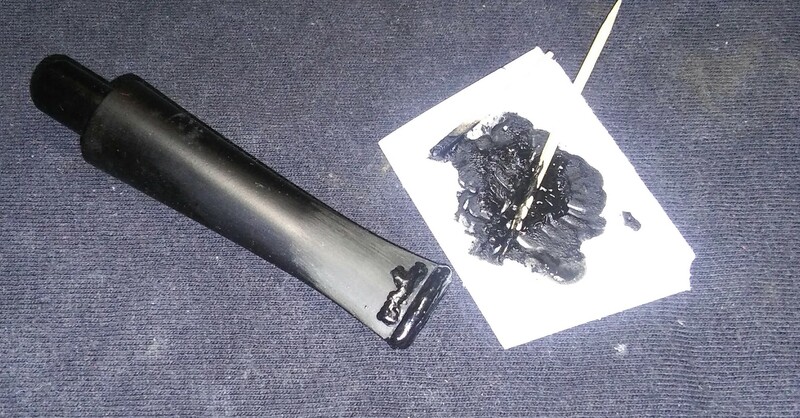 I’m going to have a hi-rez scan done so that I can make a few prints but I’m probably going to give the original to a friend. 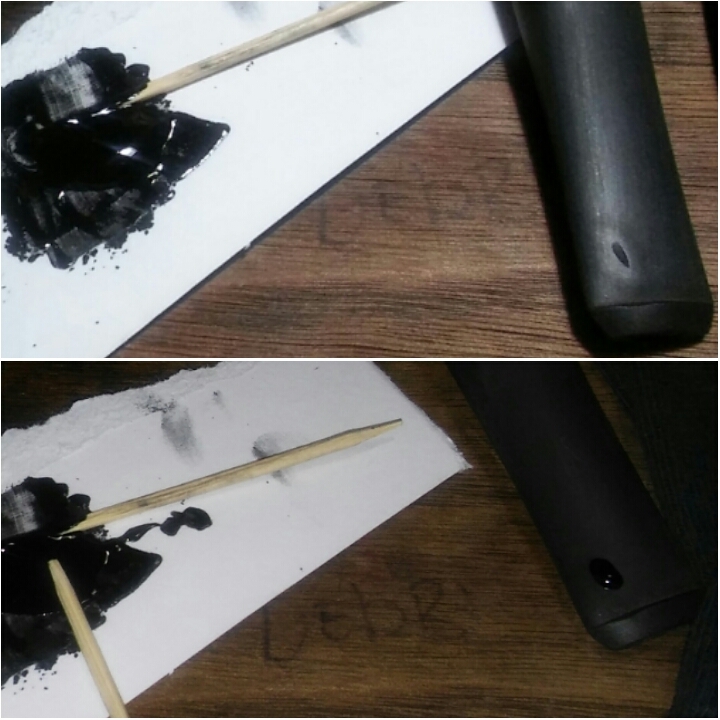 Just thought I would share here for anyone who is interested in how it turned out.